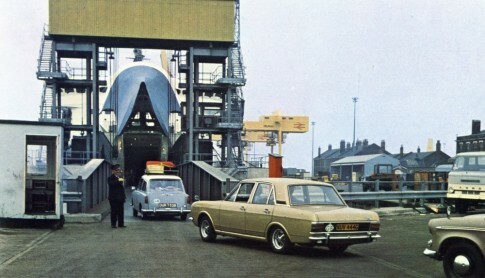 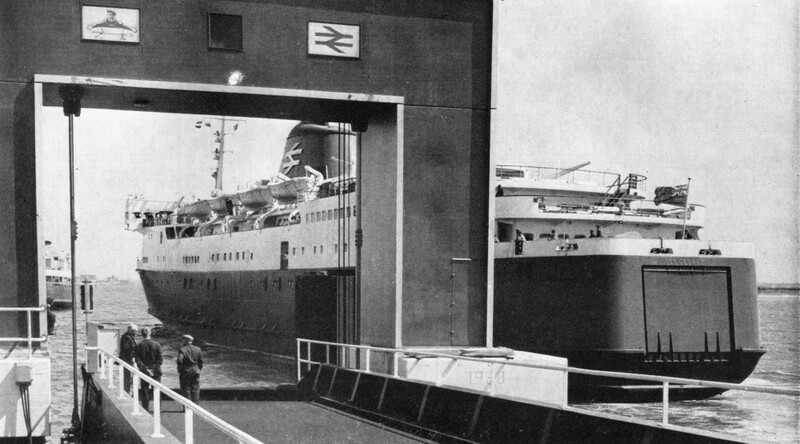 On May 18 1966 Stanley Raymond, Chairman of the British Railways Board, held a press conference at Harwich Parkeston Quay where he announced a massive investment plan including a complete redevelopment of the port and a new car ferry operation on the traditional route to the Hook of Holland – to be serviced by two new vehicle ferries. 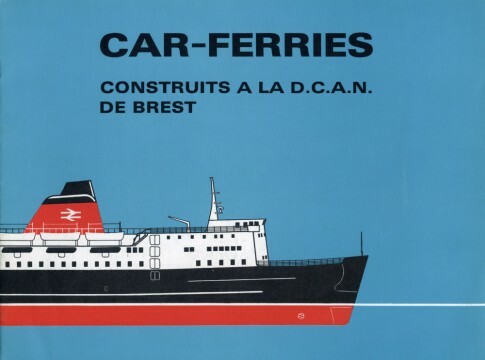 In addition a pair of cellular container ships were to be built to operate to Zeebrugge from a new container terminal adjacent to the ferry port. 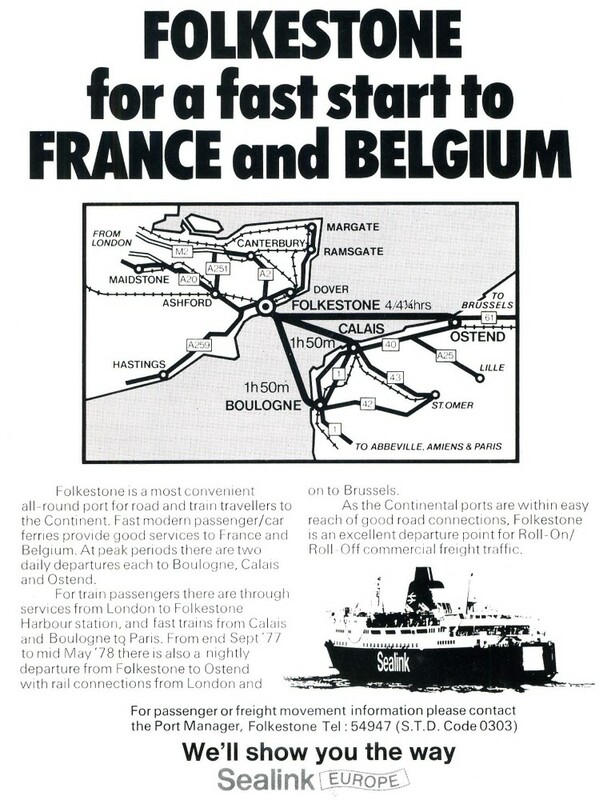 Mr Raymond explained that Parkeston Quay, with its rail-roro-container interchange, would become a showpiece which we expect people will come from all over the world to see. The two container ships became the Seafreightliner I and Seafreightliner II and had careers at Harwich stretching into the 1980s although they never appeared to have the success that had been hoped for. 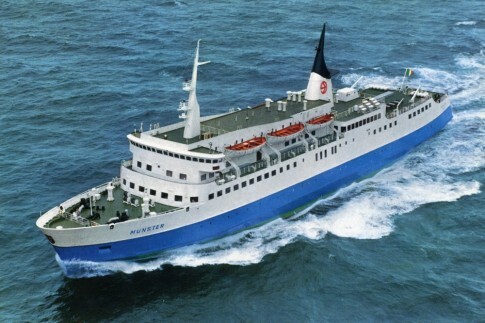 Of the two ships for the Harwich-Hook car ferry operation one was ordered by the BRB’s traditional Dutch operating partner, the Stoomvaart Maatschappij Zeeland (SMZ), with the other to the BRB’s own account. Whilst the two ships had a common basic specification, as delivered they were notably divergent in appearance. The Dutch Koningin Juliana had her design details finalised by Danish naval architects Knud E Hansen (KEH) who produced an attractive if very slightly conservative-looking car ferry – early renderings were a little more racy, more in line with KEH’s normal output, but it appears SMZ rather resisted this approach. 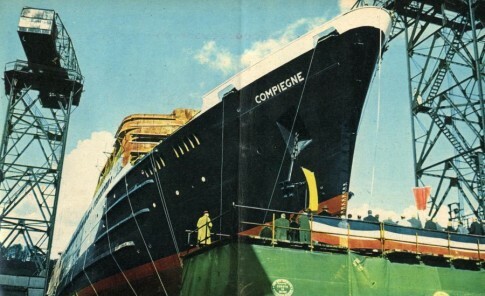 The British vessel meanwhile, built at Swan Hunters on the Tyne, took the name St George and would become a valuable reference ship both for her naval architects, Tony Rogan and Don Ripley of the BRB, and also interior designers Ward & Austin. 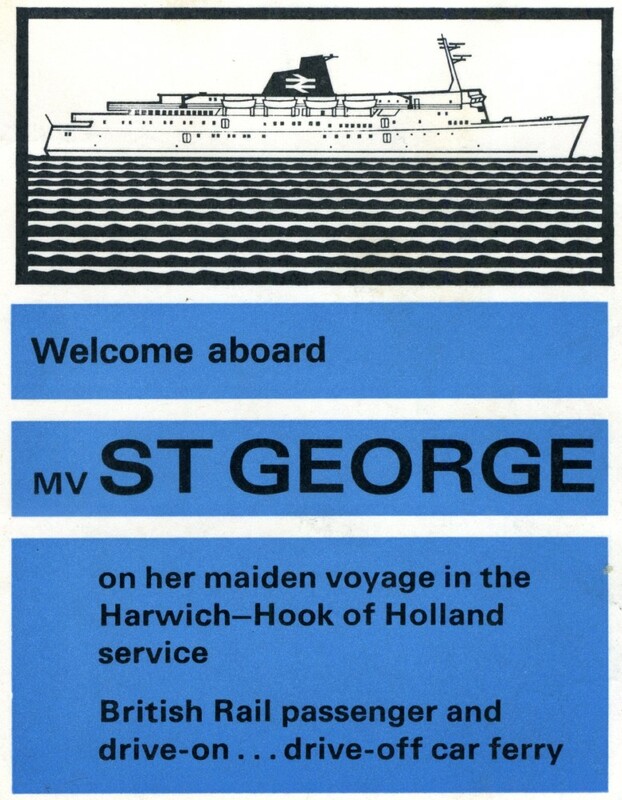 It is the St George we will focus on in this posting, but the historical context and wider Harwich scene deserve a mention in passing. 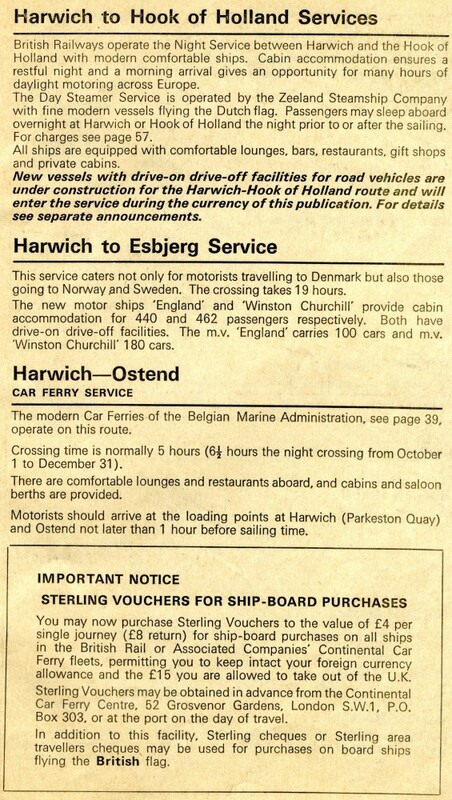 Prior to 1968 the Harwich-Hook of Holland route operated on a pattern established just after the War where the Dutch ships maintained day crossings in either direction with overnight sailings provided by steamers of the Eastern Region of British Railways. 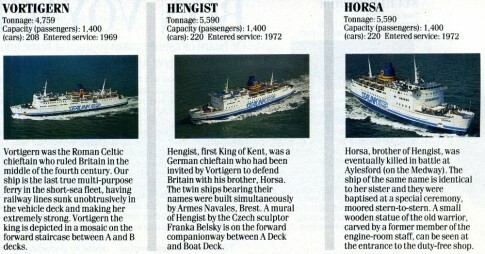 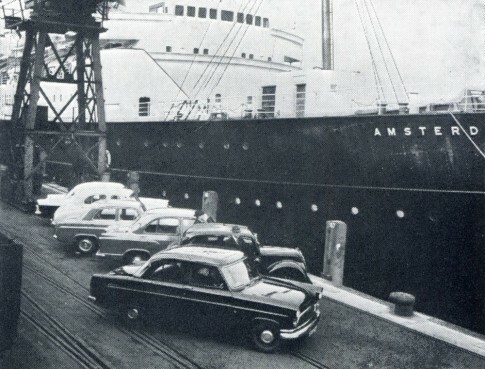 The most recent ships of each company – the futuristic-looking Koningin Wilhelmina and the elegant but more traditional Avalon – had been introduced as recently as 1960 and 1963; nonetheless the decision was made to completely overhaul the operation and the two new, drive-through, car ferries were to essentially replace all four existing vessels. Whilst the traditional passenger ferries such as the Amsterdam (below) were able to carry cars, the crane loading procedures were slow and complicated. 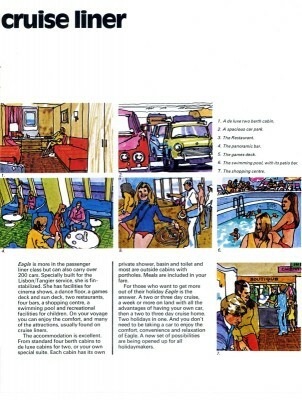 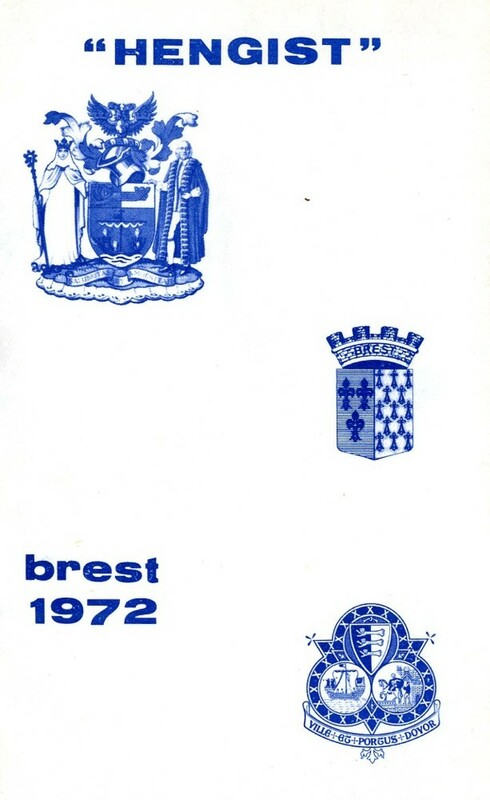 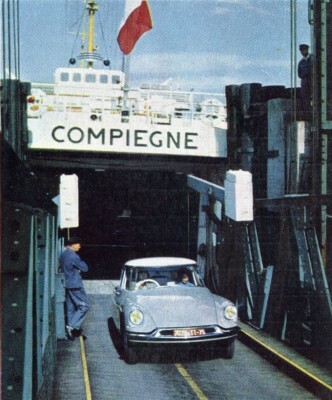 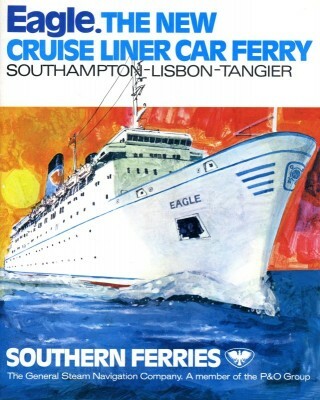 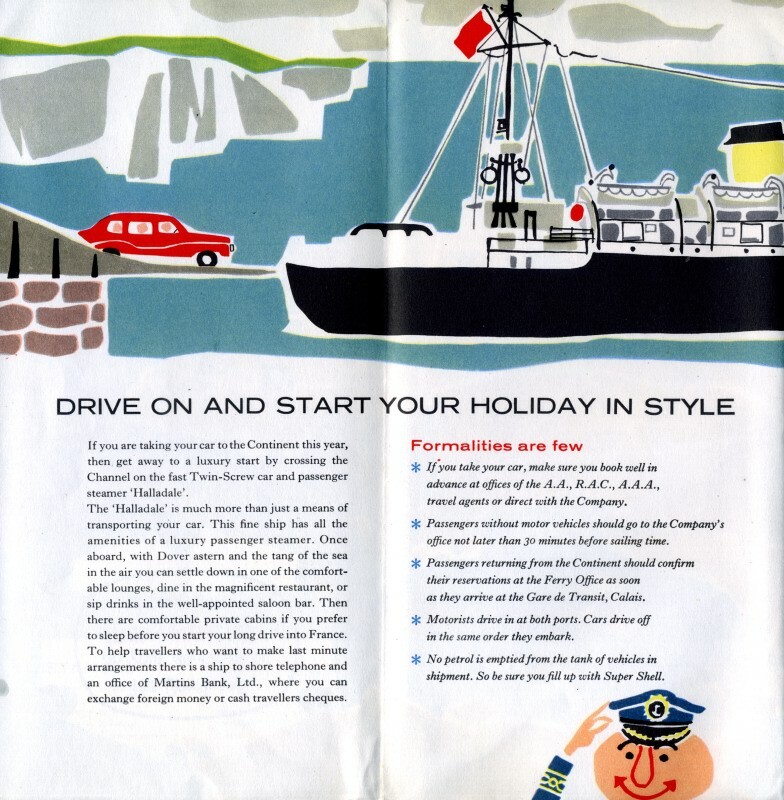 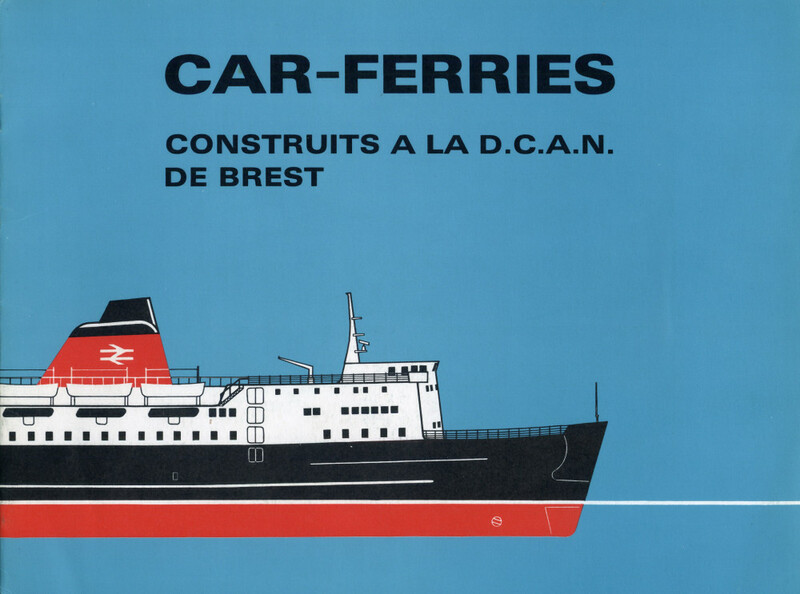 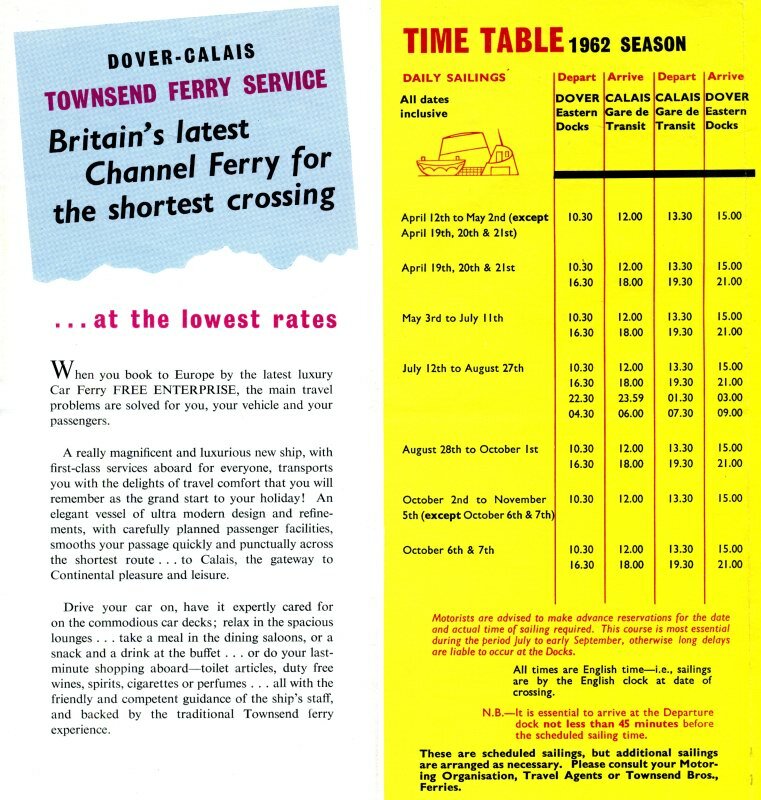 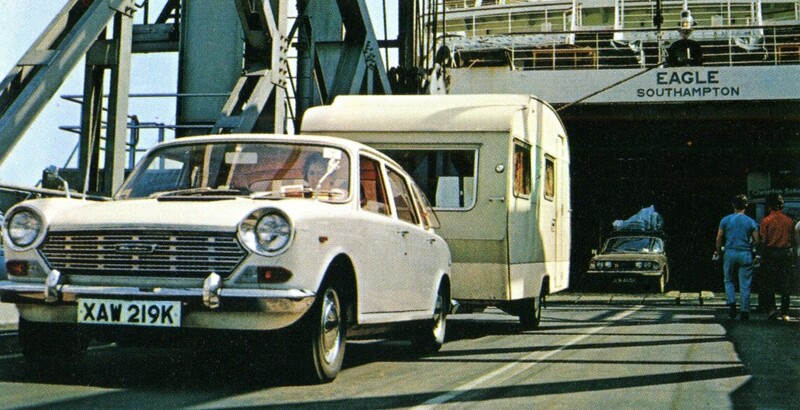 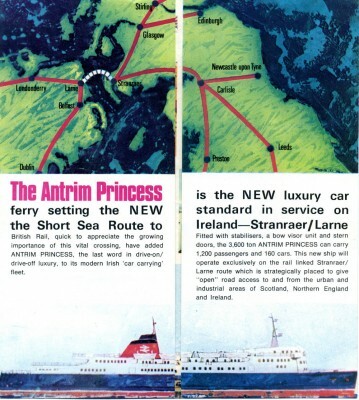 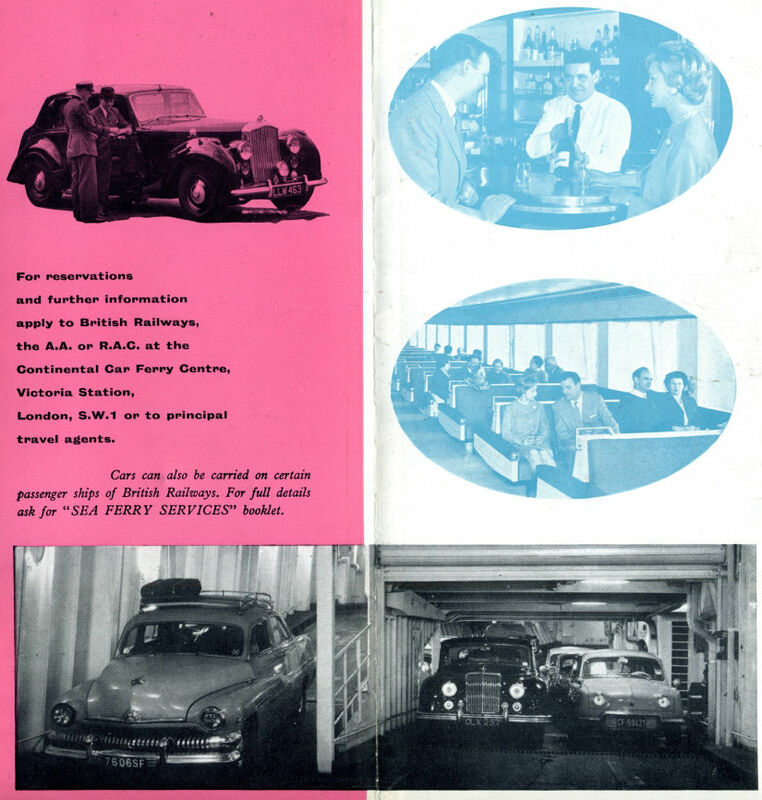 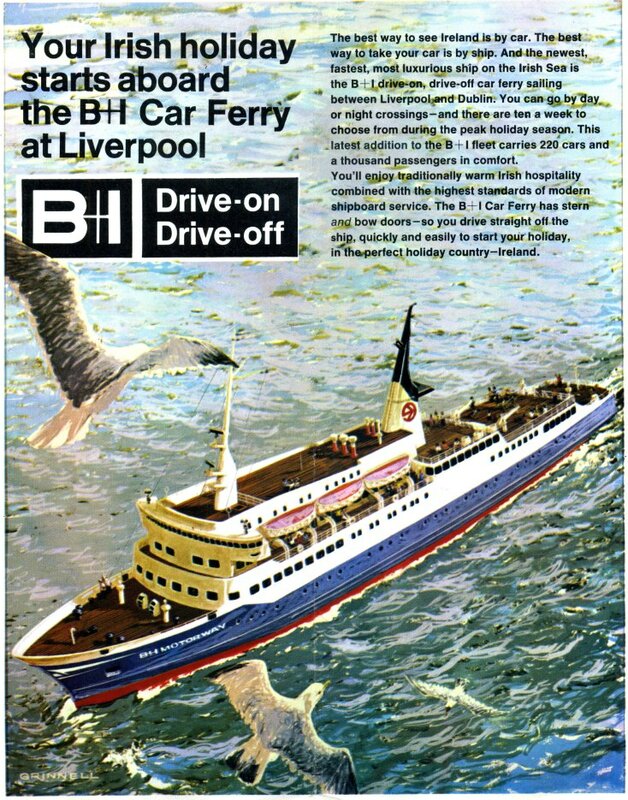 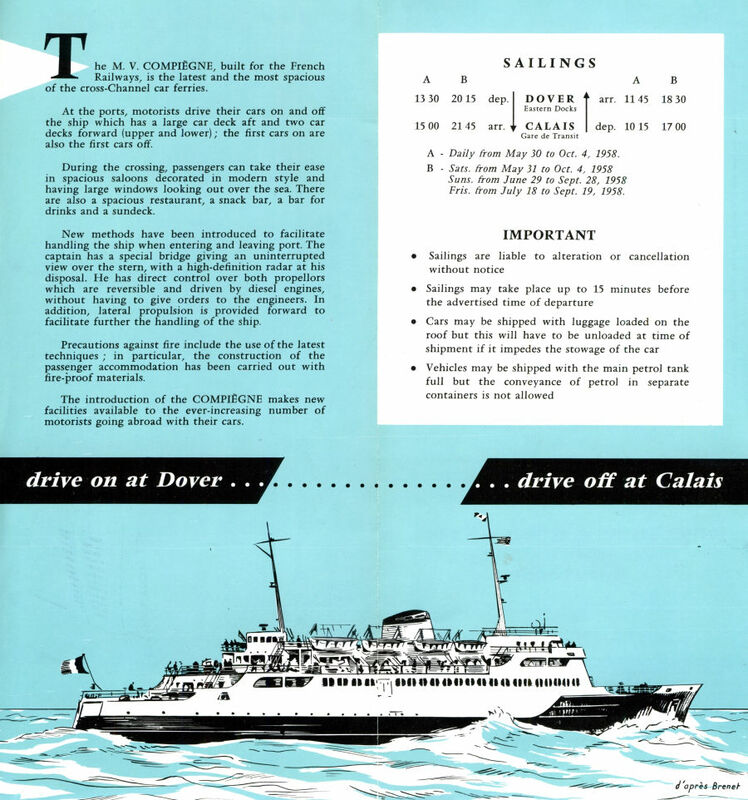 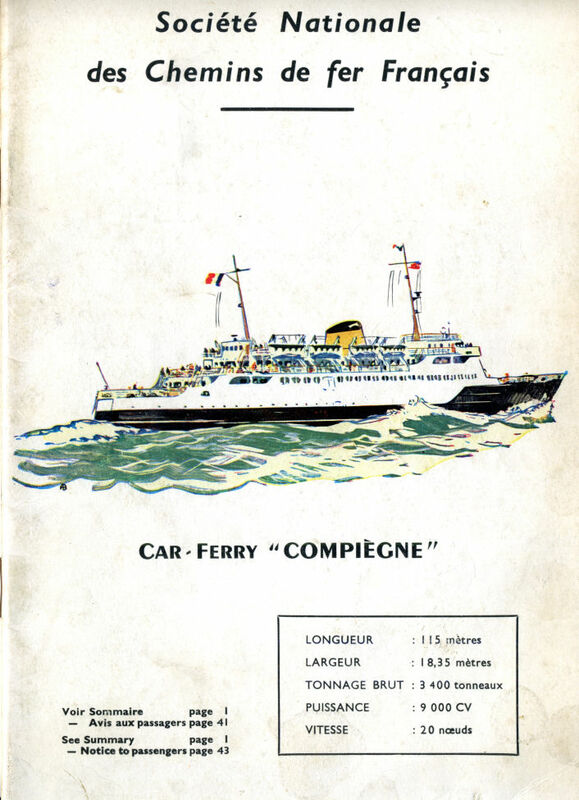 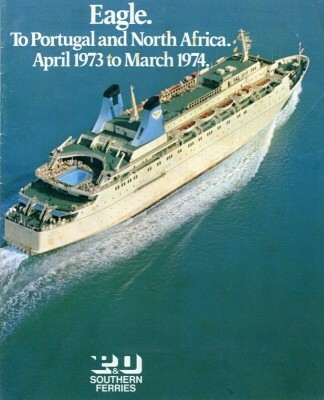 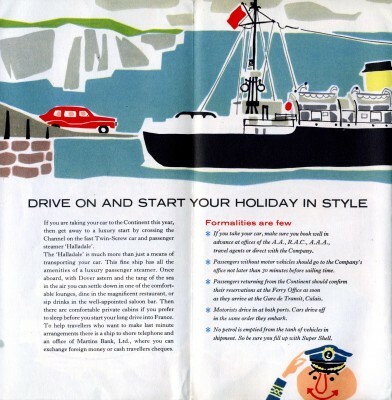 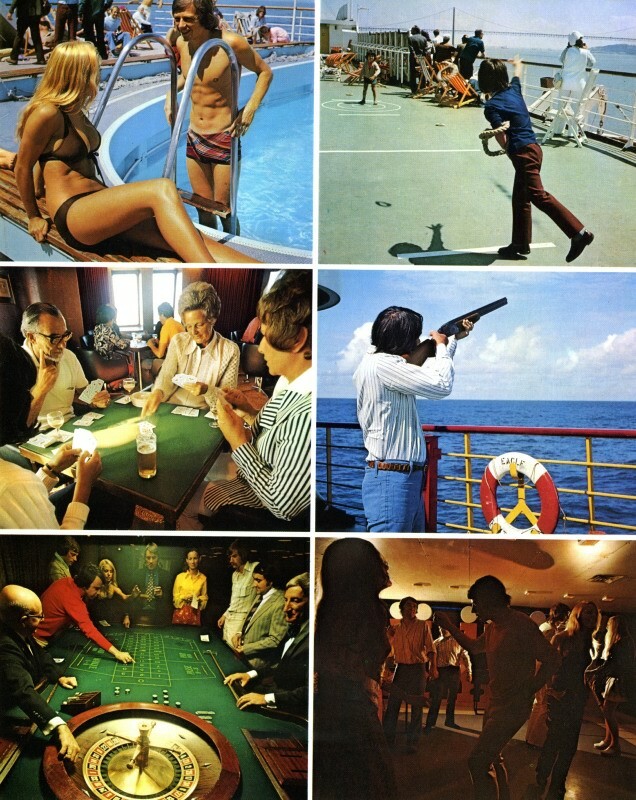 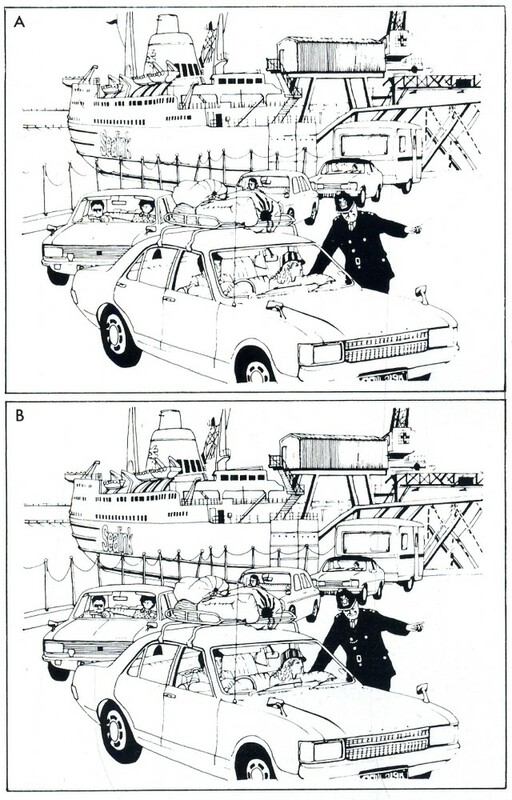 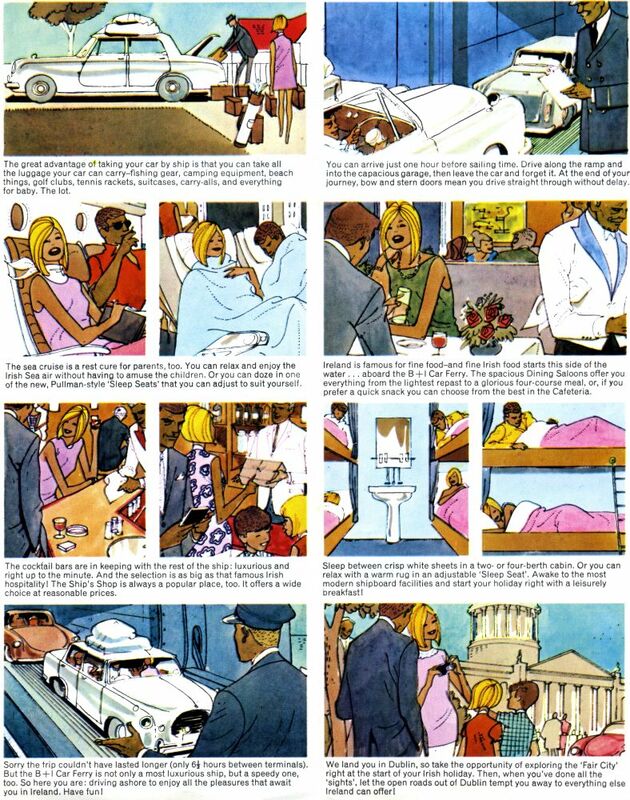 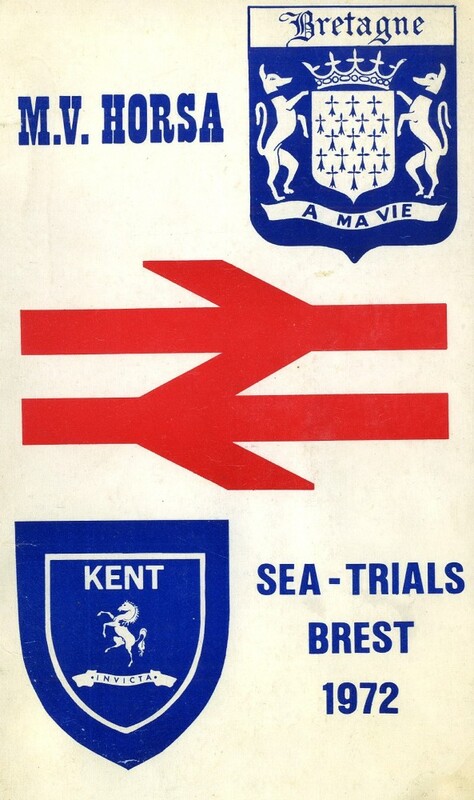 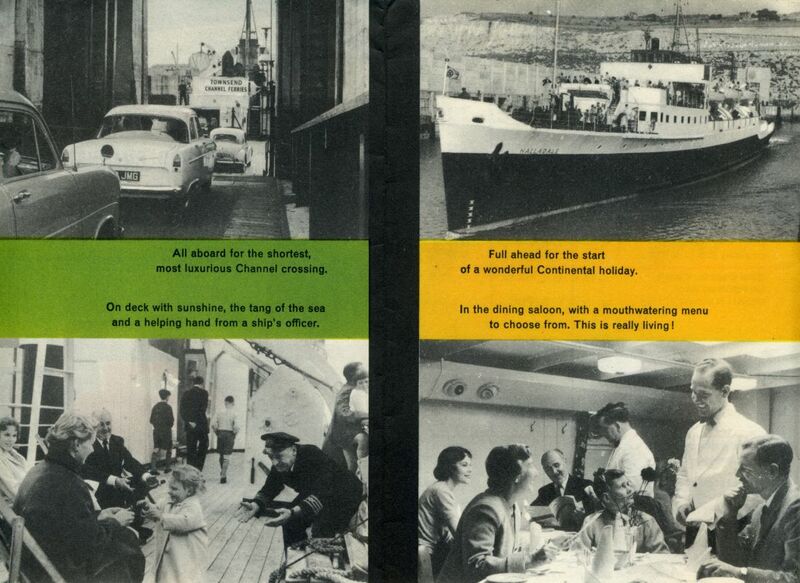 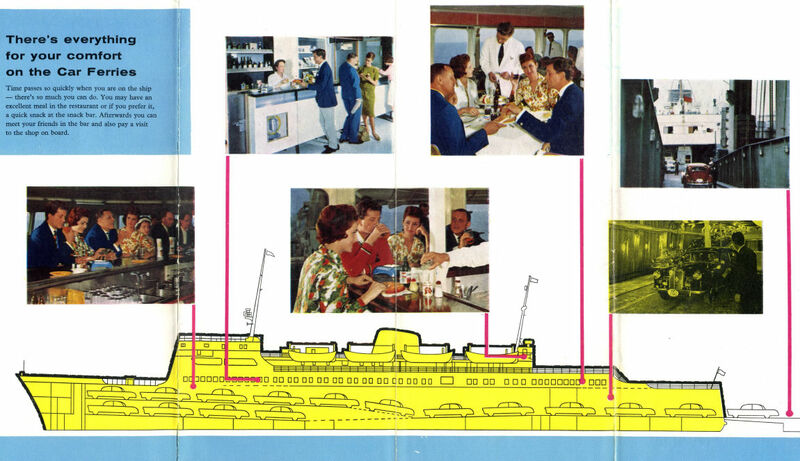 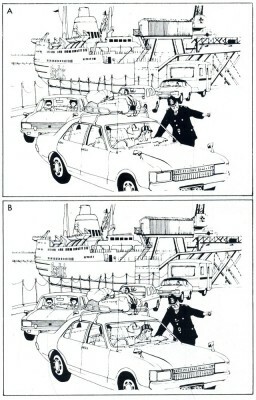 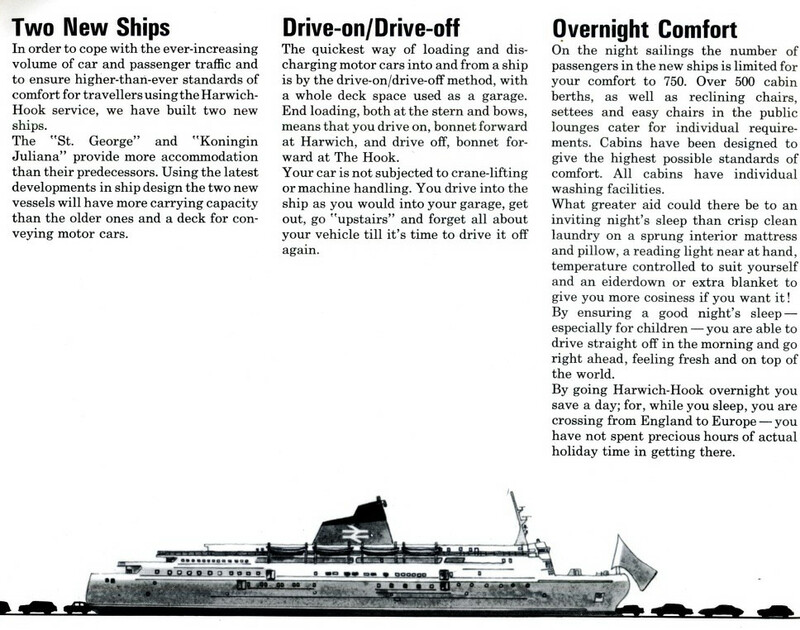 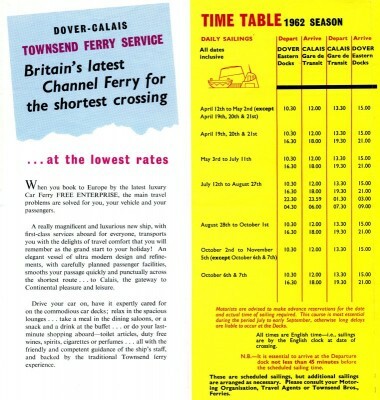 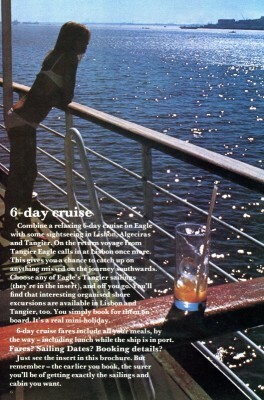 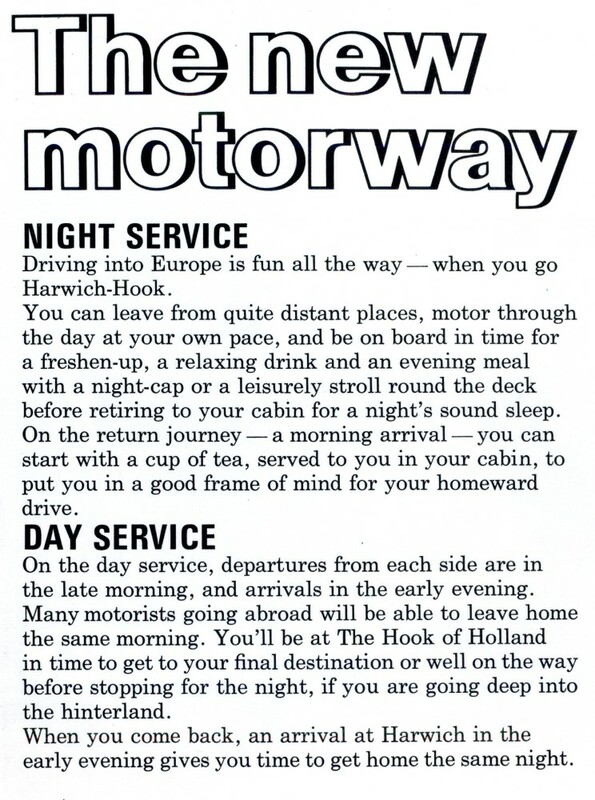 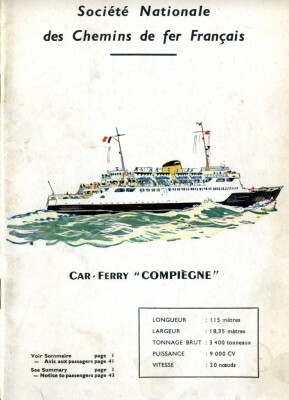 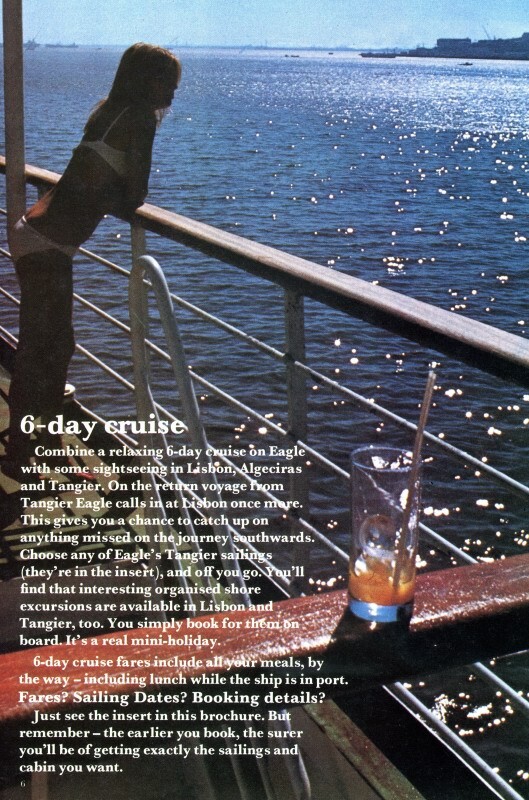 Changeover: A page from the 1968 BR Car Ferry guide. 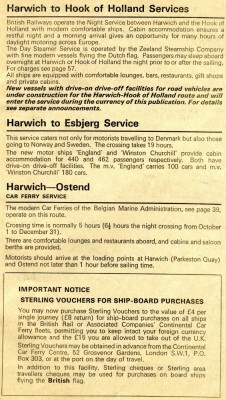 Note the references to the short-lived Harwich-Oostende car ferry operation as well as to DFDSs Harwich-Esbjerg service, both of which utilised the two new portal linkspans at Parkeston Quay. 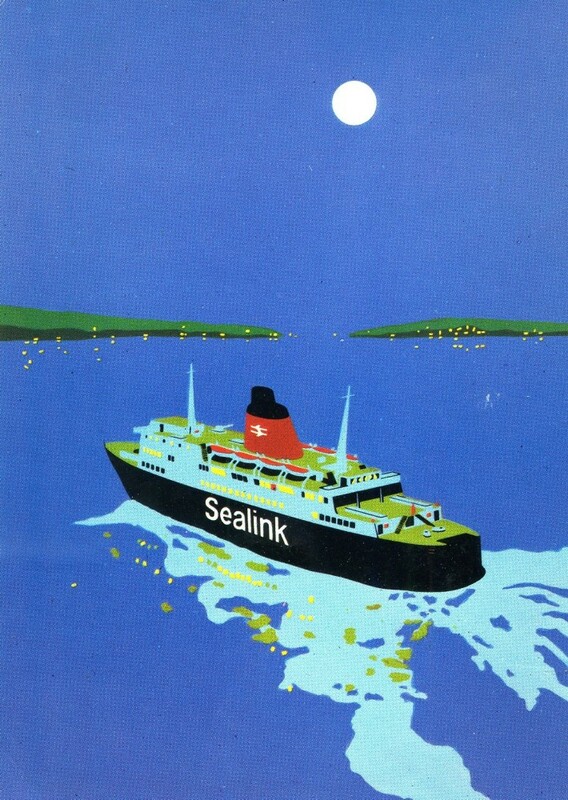 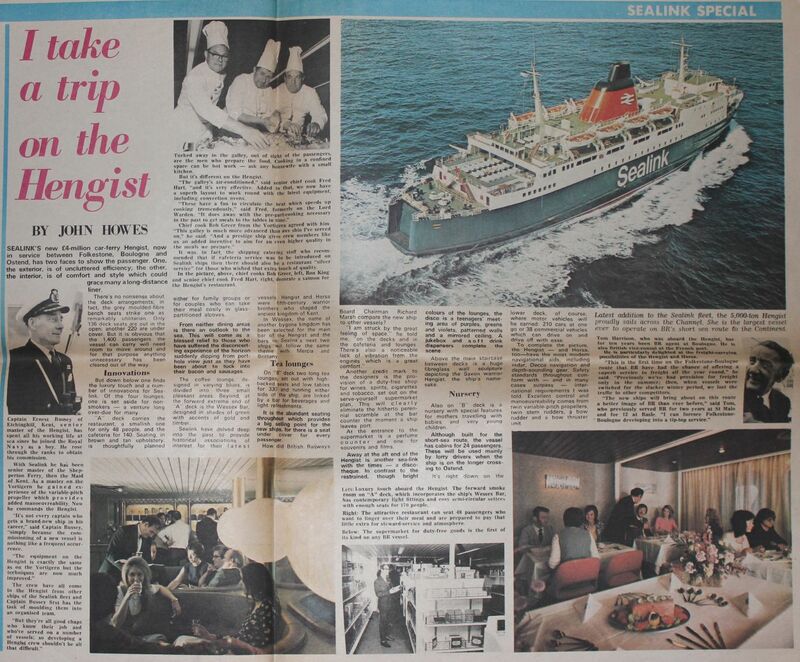 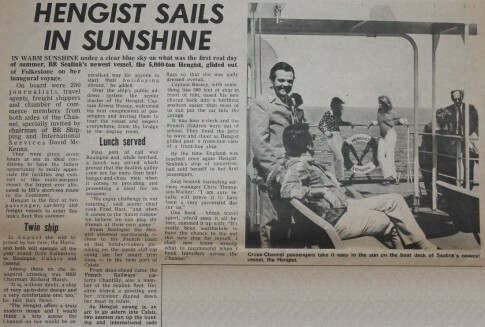 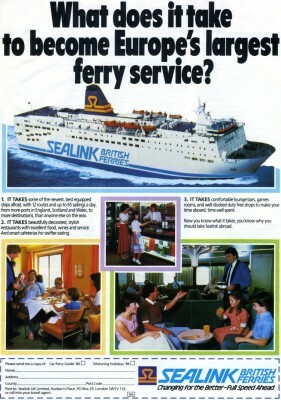 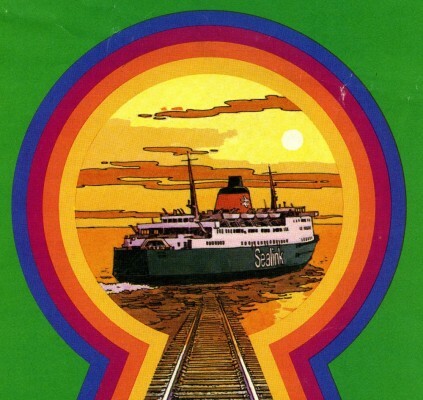 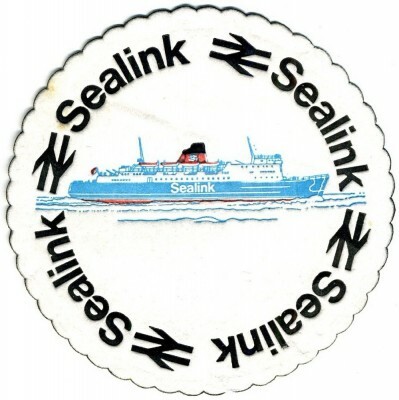 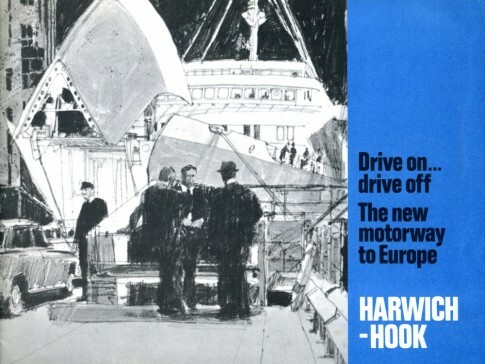 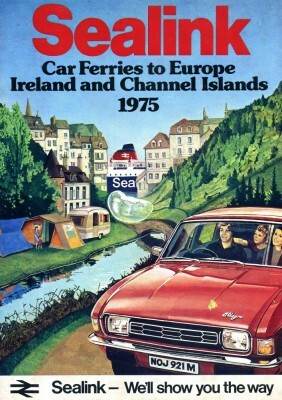 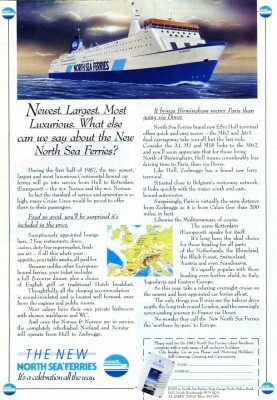 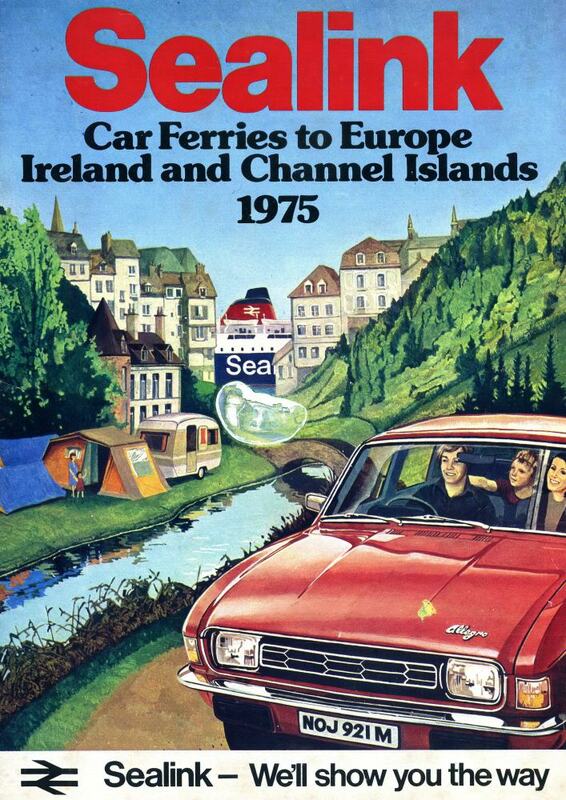 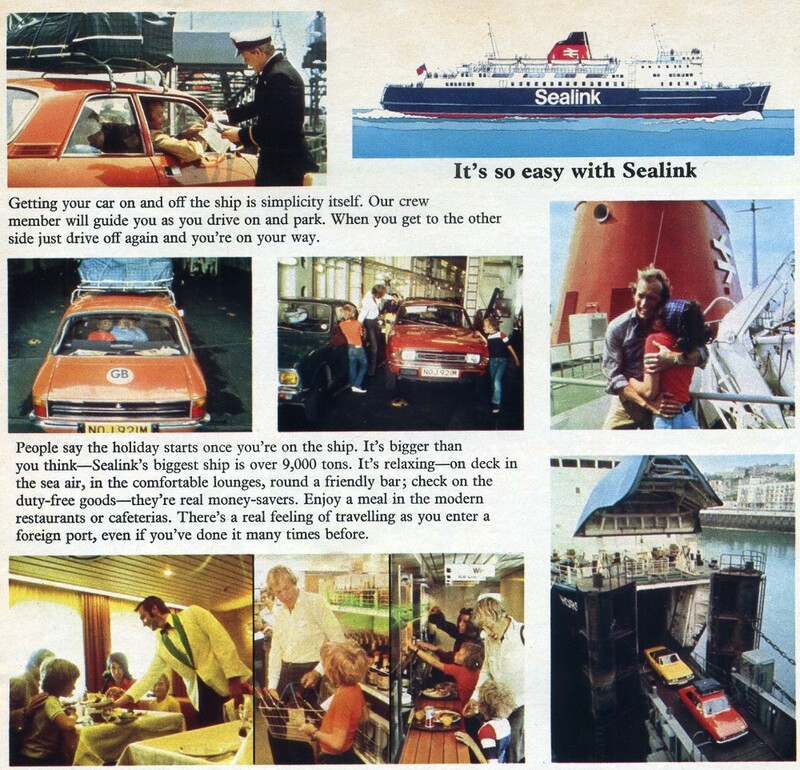 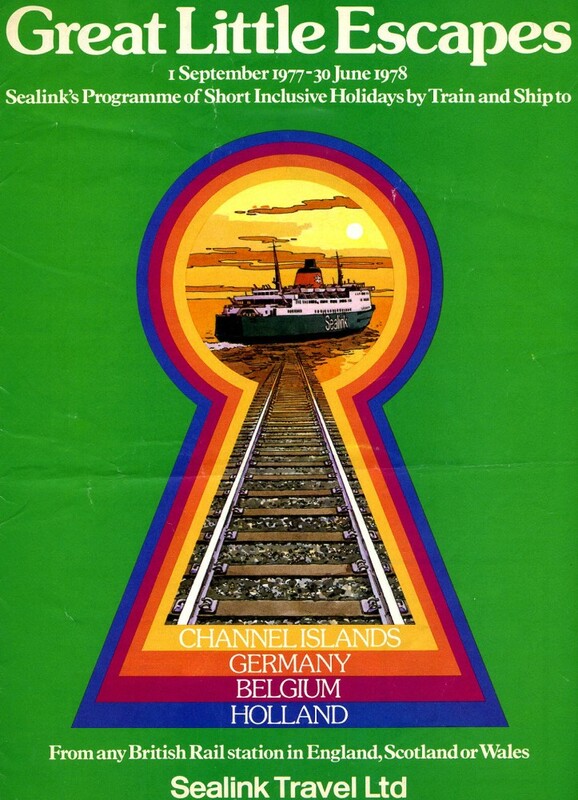 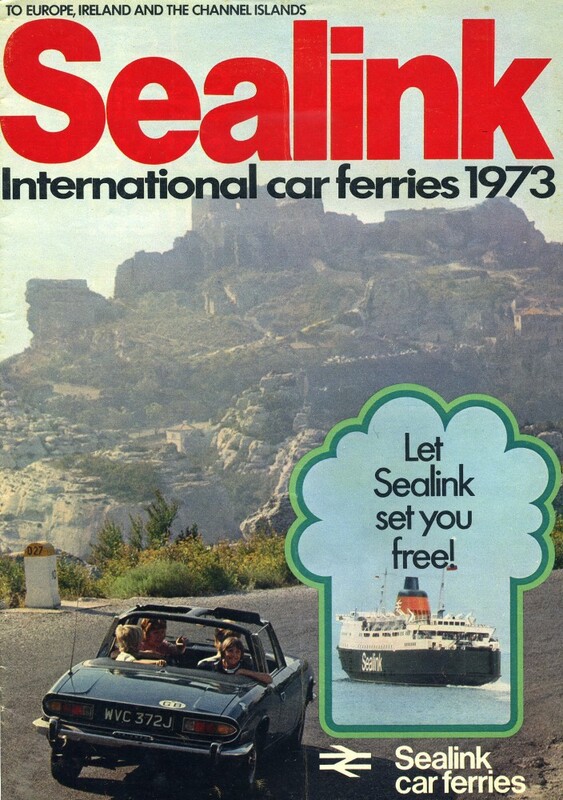 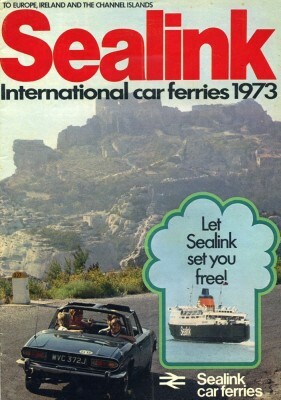 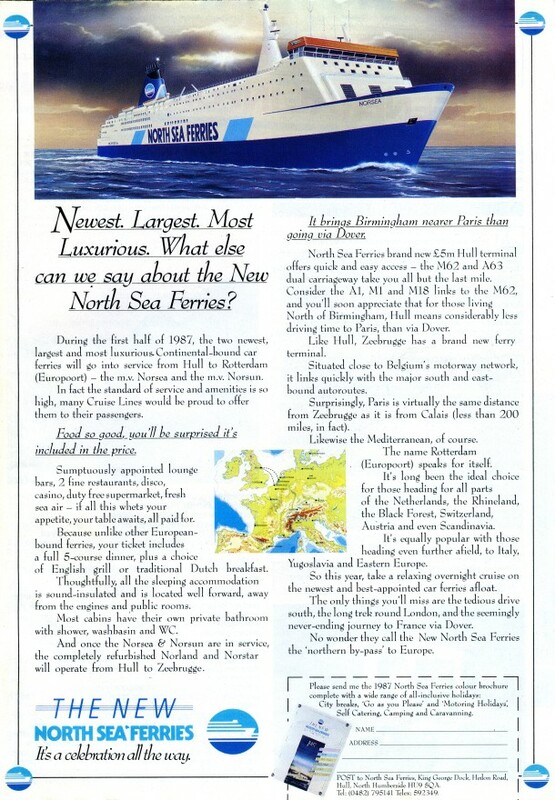 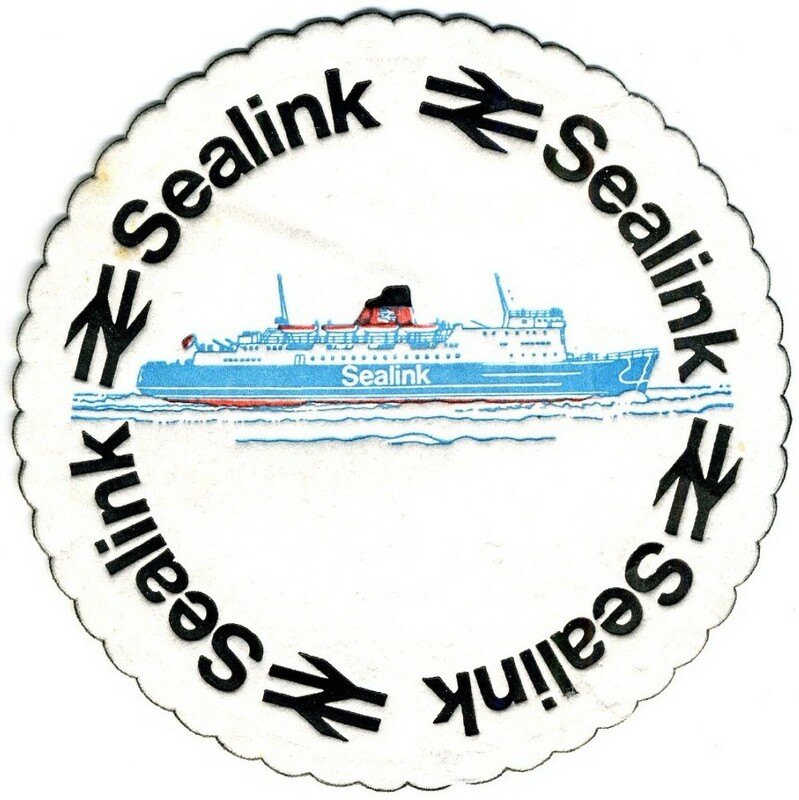 DFDS would have been a logical and non-competing associate to the Sealink consortium but this cross-promotion petered out in the early 1970s. 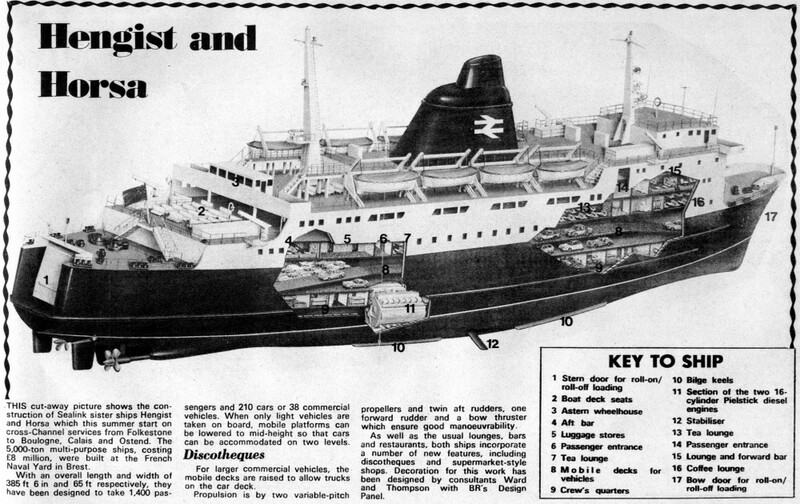 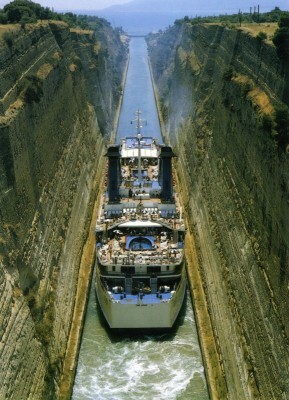 An early model of the St George, before the new funnel design was finalised following wind tunnel testing. A later artists impression with the final design elements all in place. 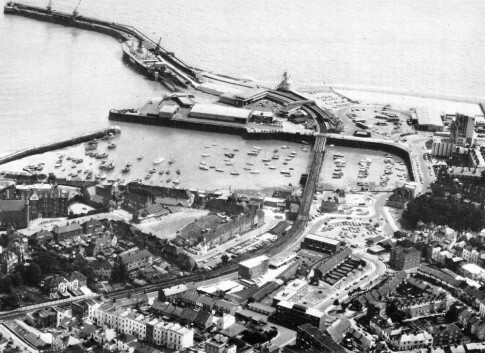 And an aerial view of the finished product in her original livery, before the later application of the Sealink title to the hull. 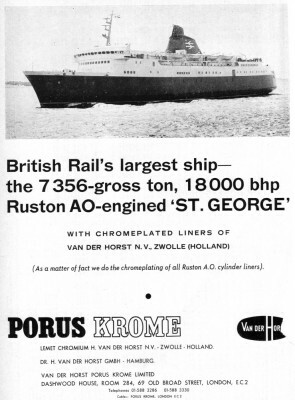 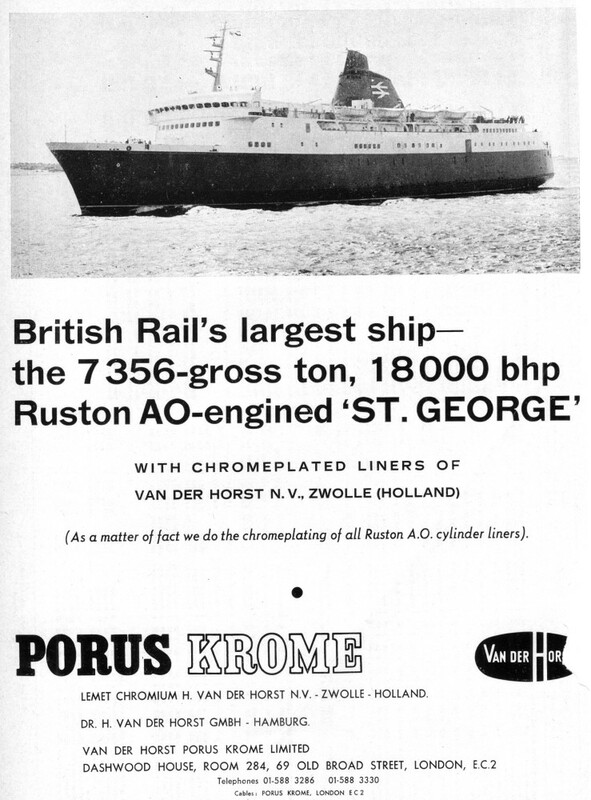 An advert for Van der Horst, a supplier who worked on the ships Ruston main engines. 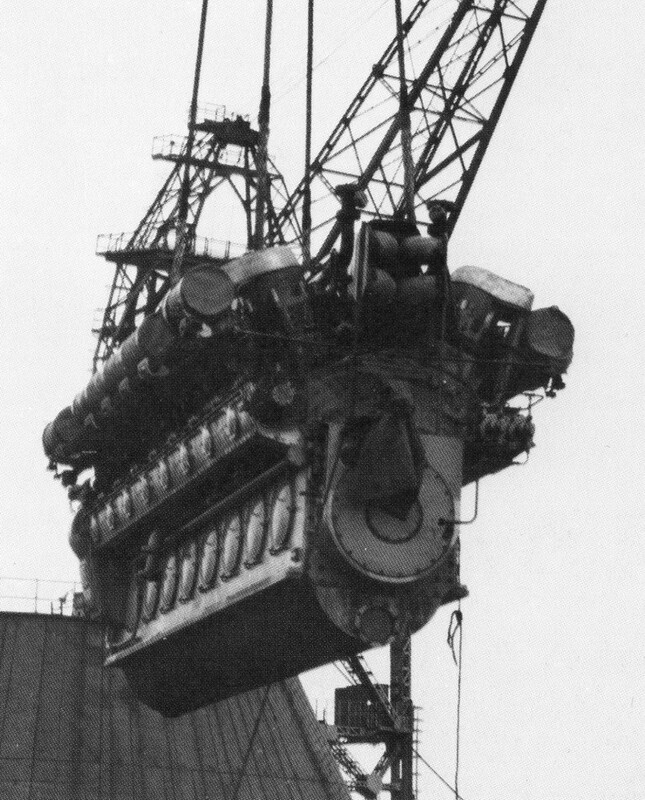 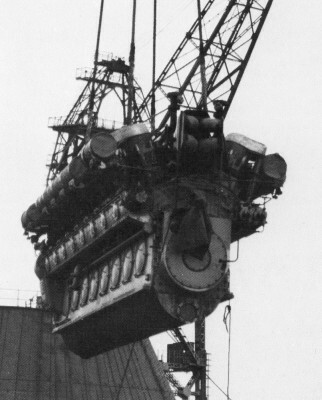 The machinery came in for much adverse comment over the years but Rogan and Ripley, whilst admitting problems, noted that the four-engine layout ensured the ship never lost a sailing. 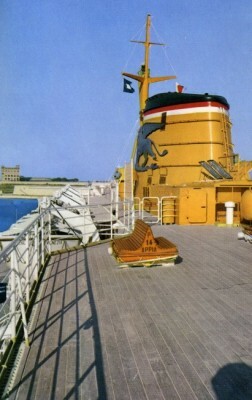 Vibration was however a recurrent and unresolved issue throughout the ships BR career. 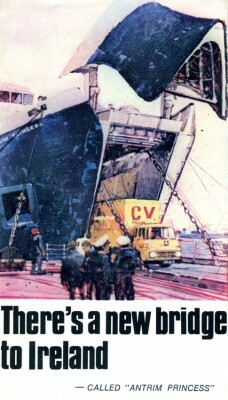 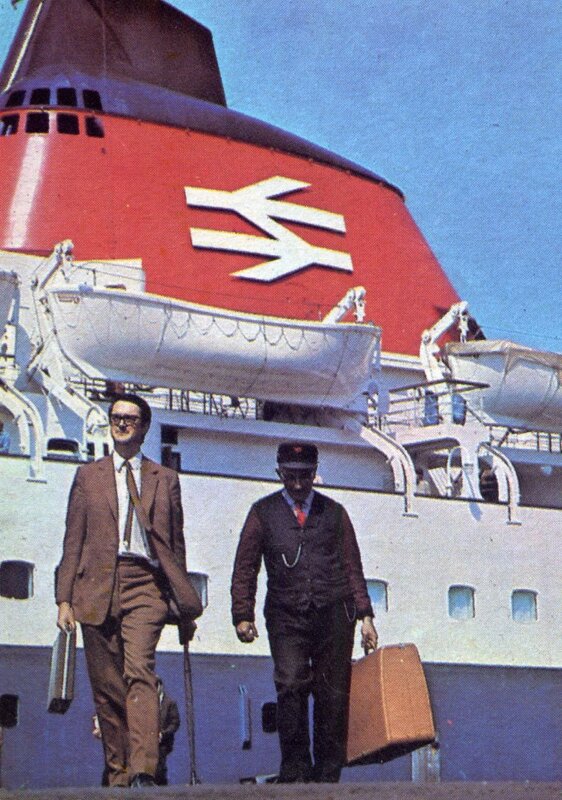 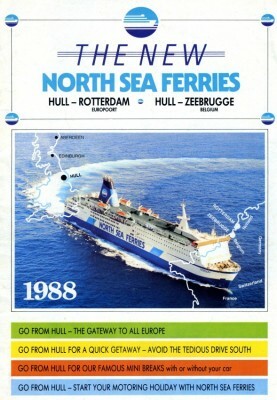 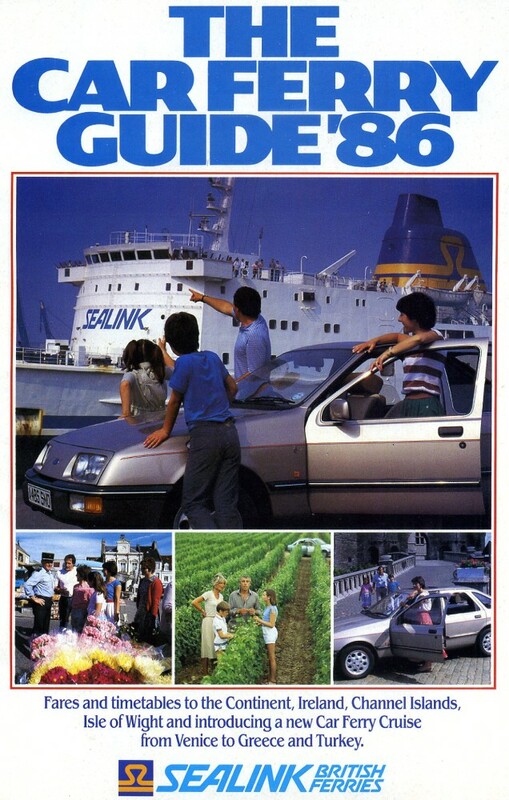 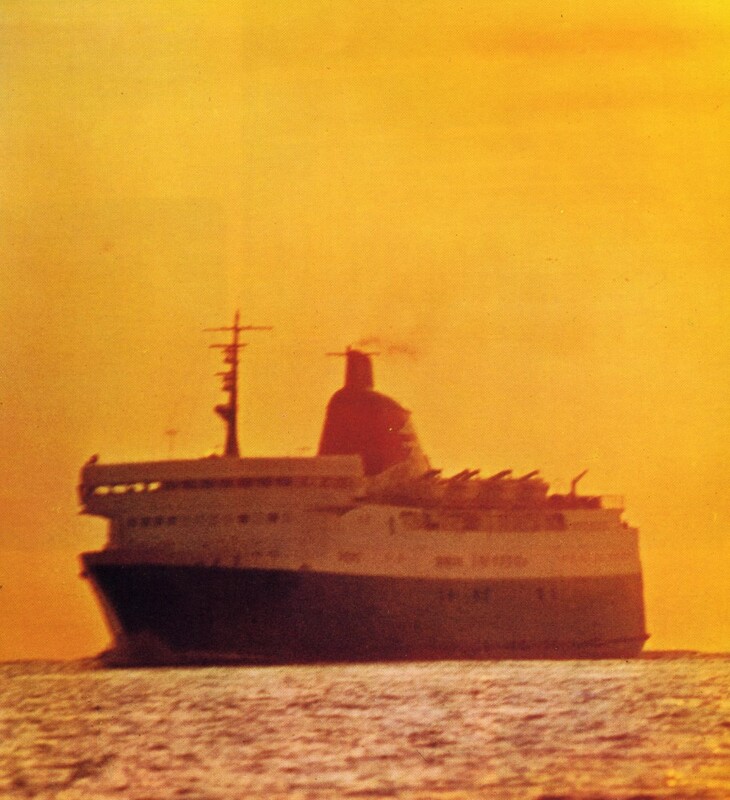 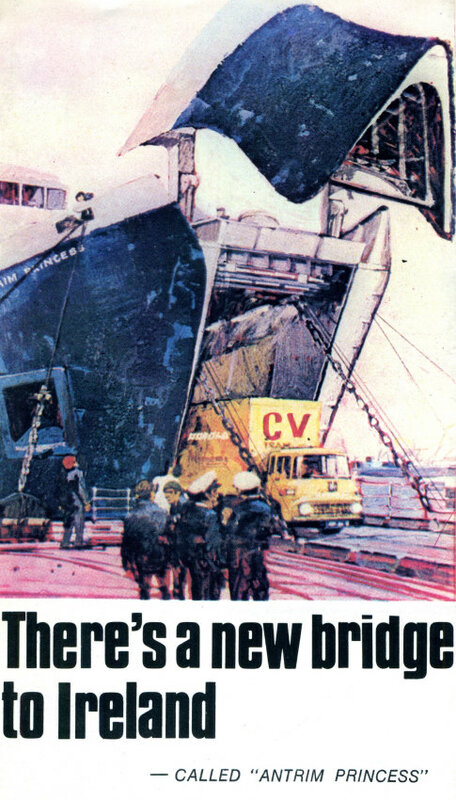 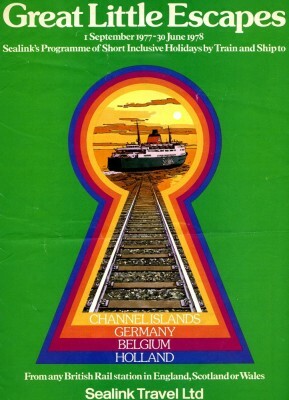 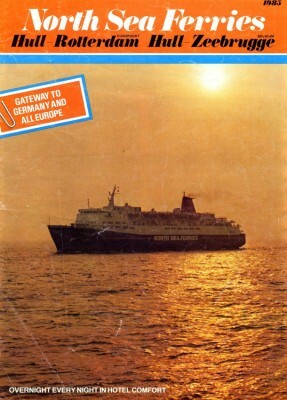 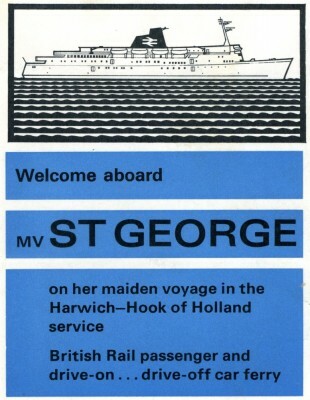 The front cover of an inaugural brochure for the St George - erroneously however the ship depicted appears to be the Winston Churchill of DFDS, seen on her normal berth, the western of the two portal linkspans. 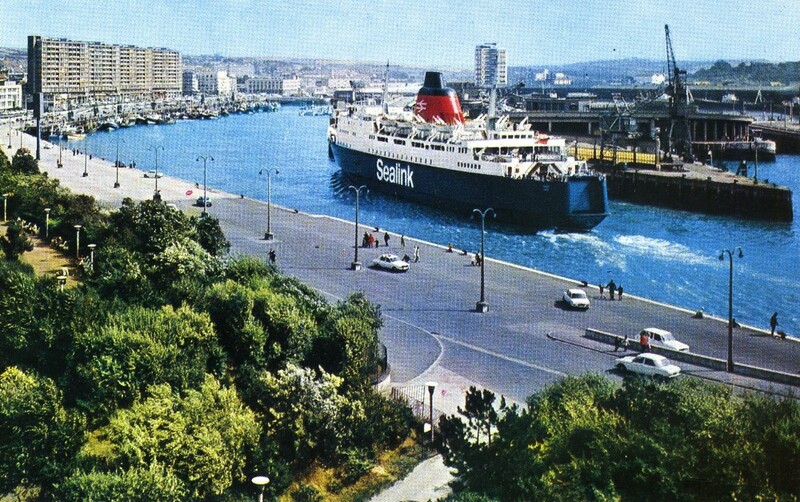 An approximation of this image would have been more appropriate: the St George on the eastern berth with the container terminal visible in the background. 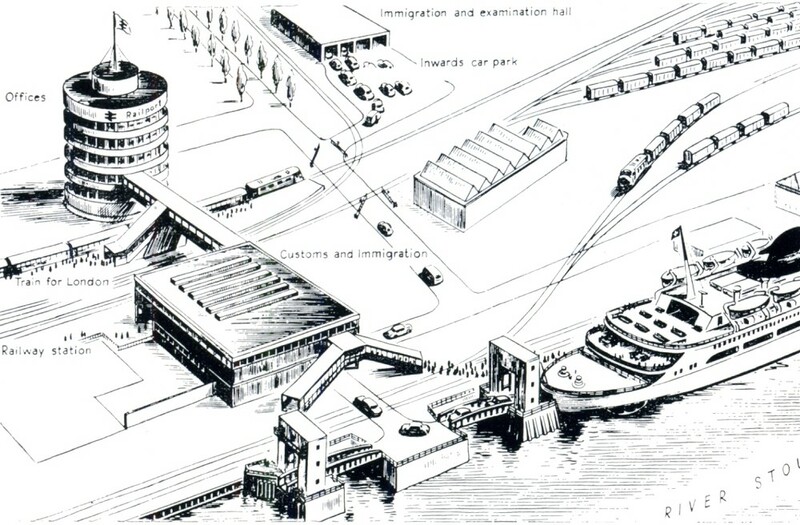 An early proposal for the Harwich redevelopment with the two linkspans and the Winston Churchill in the foreground and a circular office block in the background. 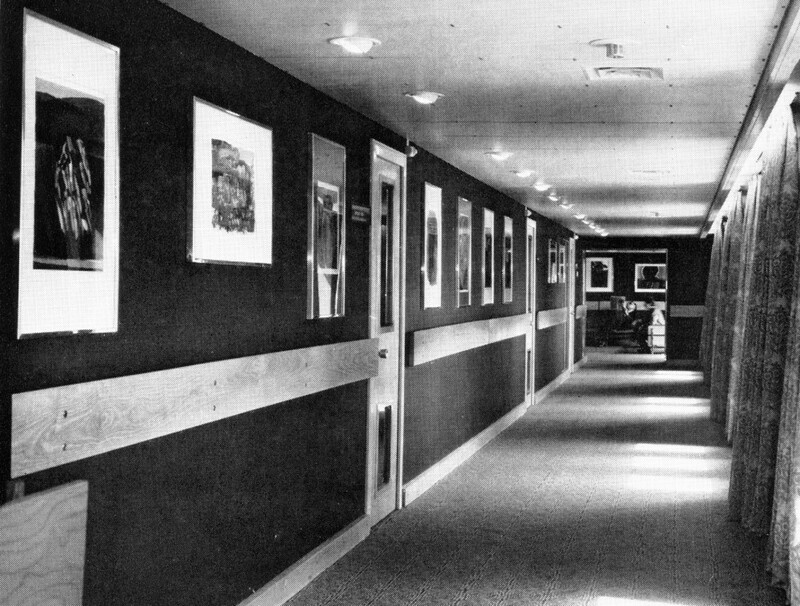 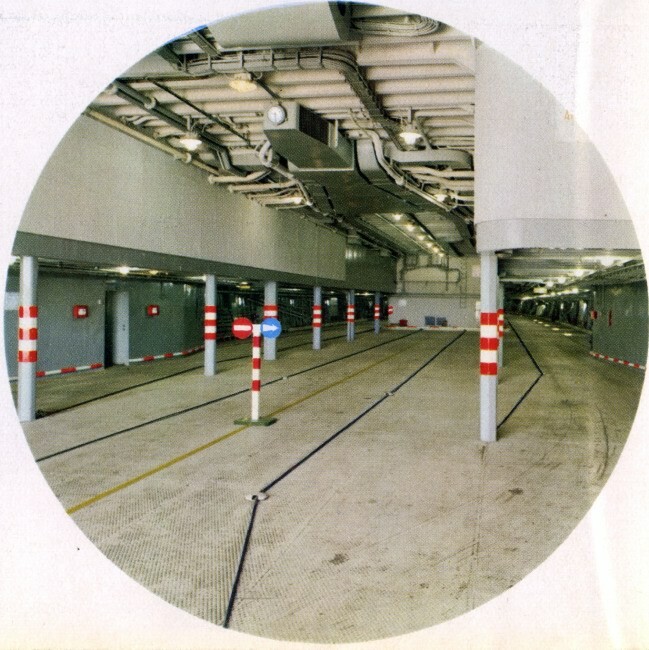 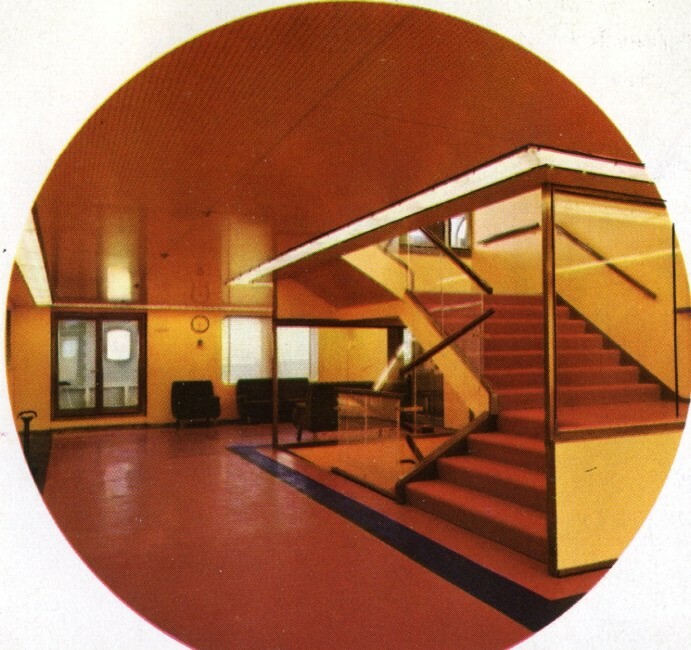 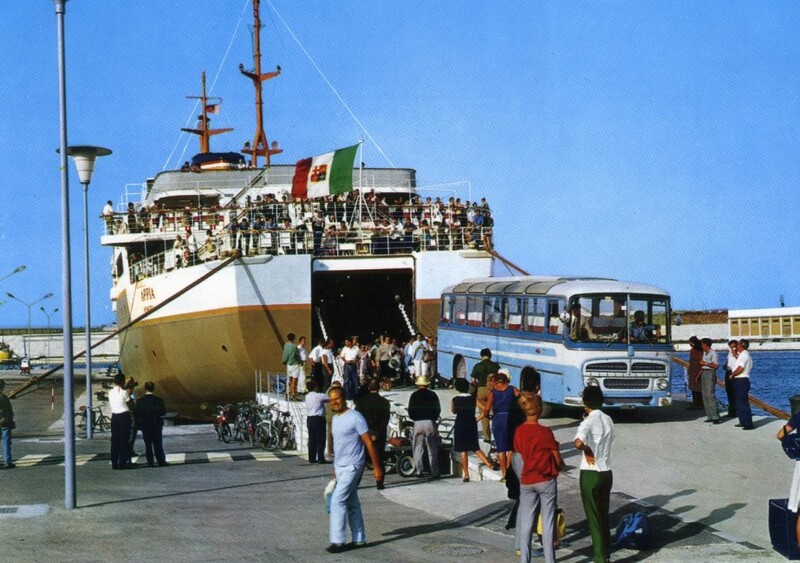 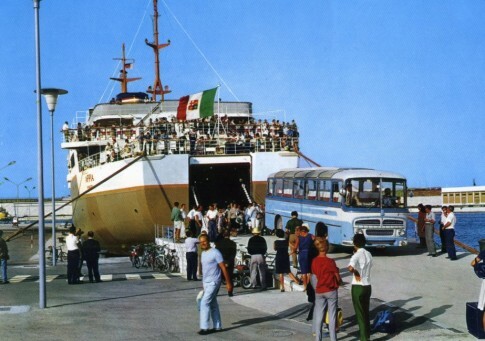 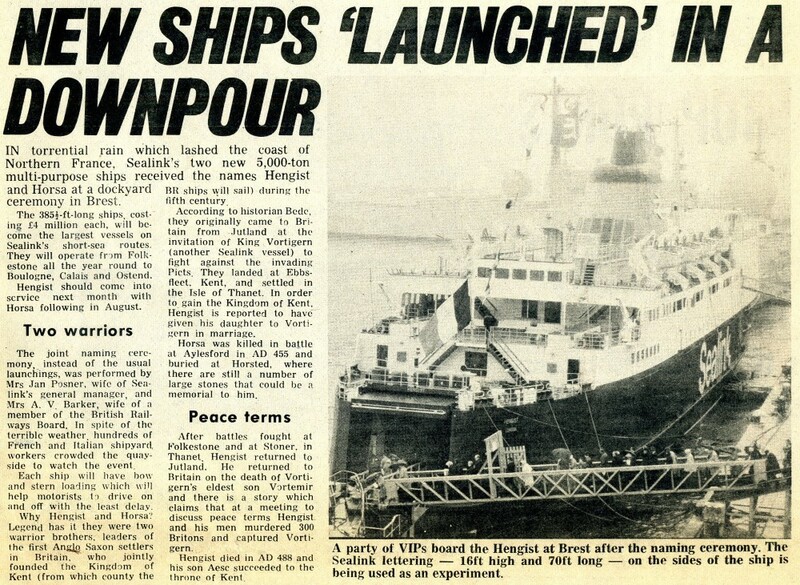 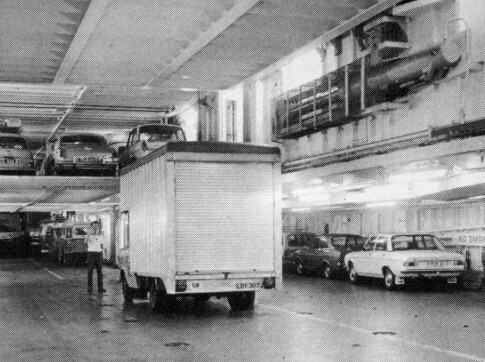 The final scheme was completed in 1971 to a rather different design - including covered walkways direct to the ships. 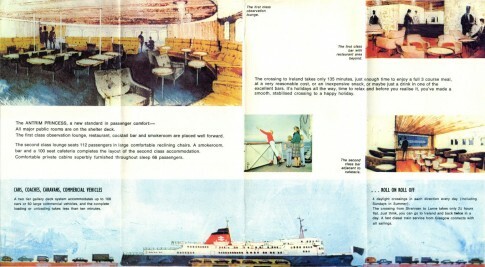 Prior to this foot passengers had to brave the elements as below. 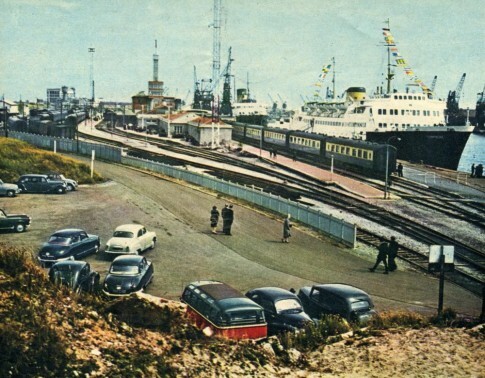 Another view of the St George on the berth at Harwich. 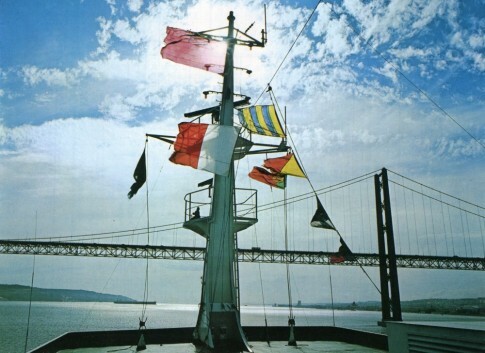 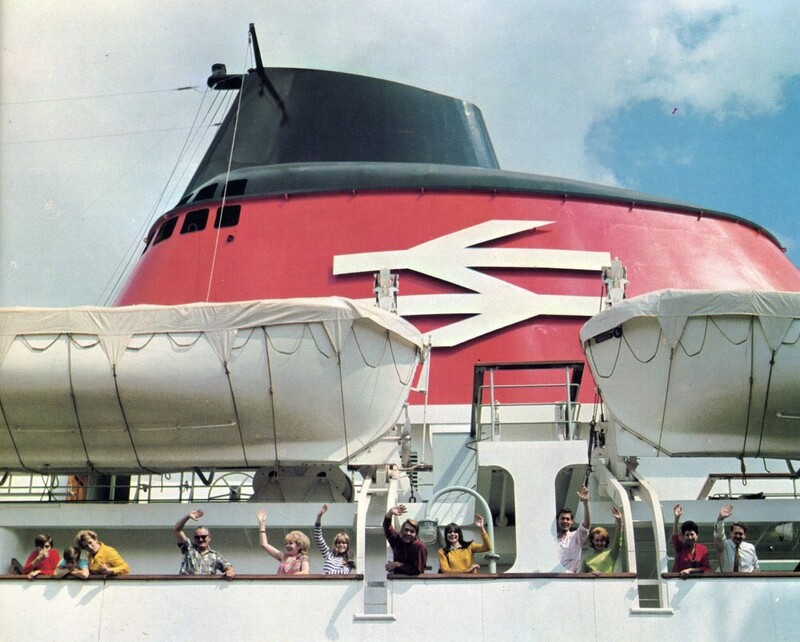 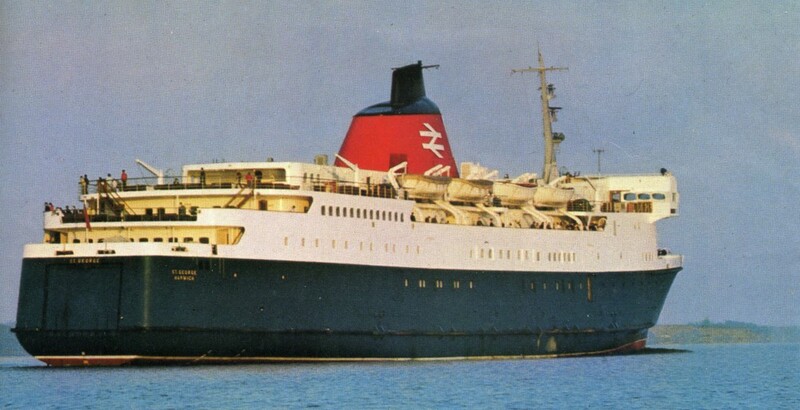 Visible on the edge of the ship's raised bow visor is the five pointed star of the Great Eastern Railway, a marking which had been a feature of British Harwich ships for a century - the St Edmund of 1974 discontinued this tradition. 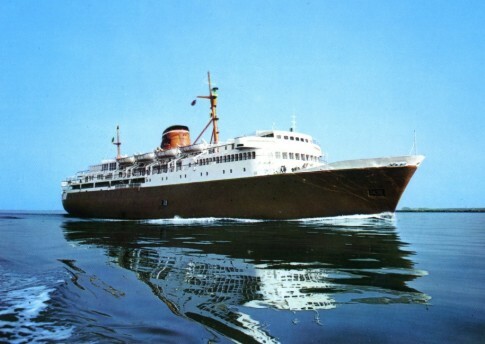 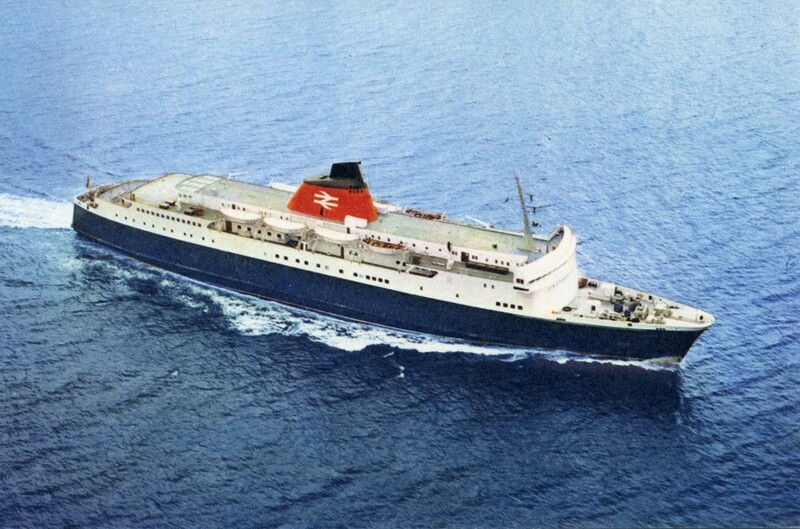 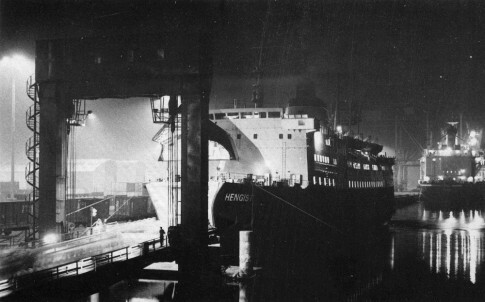 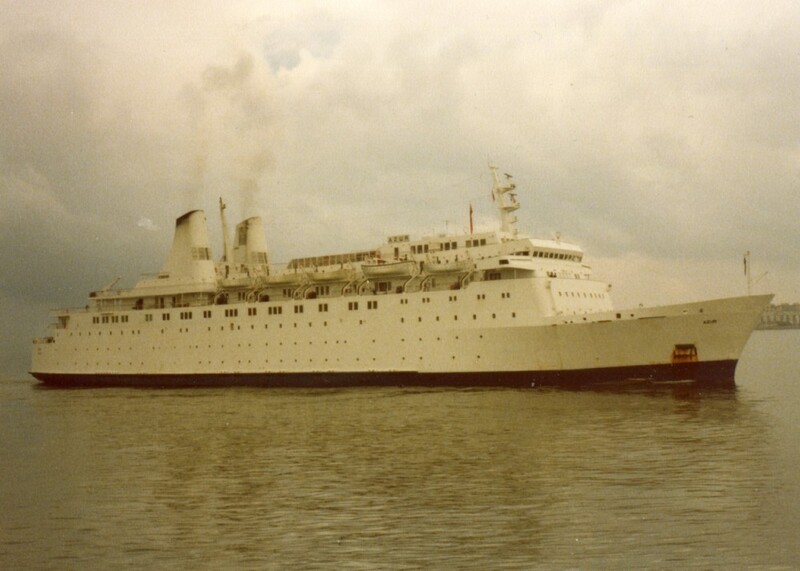 The St George entered commercial service on 17 July 1968 - delays to the arrival of her Dutch counterpart meant that initially she operated only night sailings but ultimately both ships would operate day and night, the St George maintaining the morning crossing from Harwich and the overnight return. Although there have been massive changes in company structure, size of ship and nature of operation in the past 42 years it is notable that this simple pattern of operation is retained to this day on Stenas latest two massive superferries. 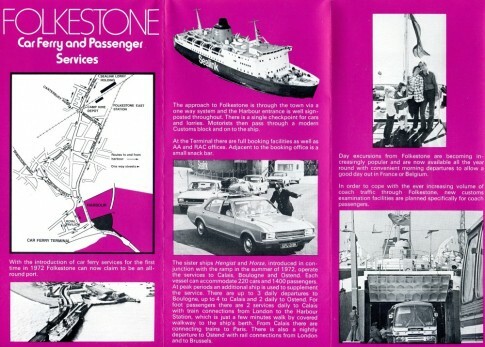 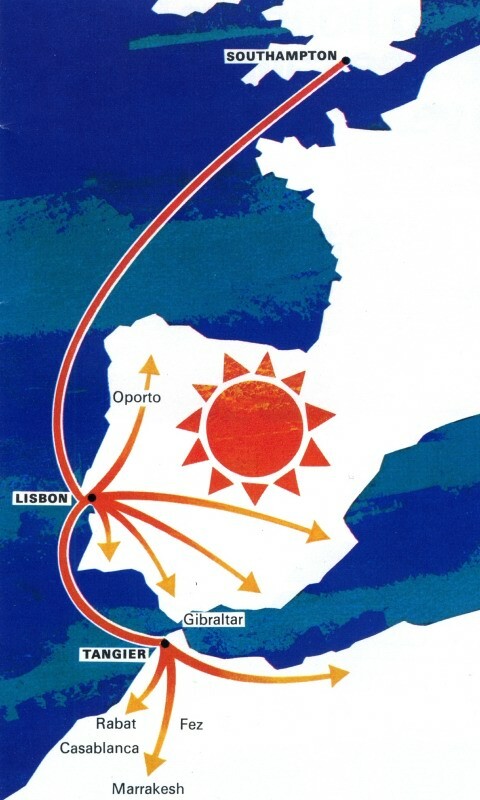 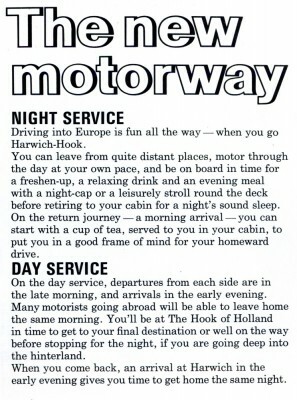 Returning to the inaugural brochure - the new motorway was opening up new possibilities for motorists. First Class facilities were to the stern and Second Class forward. 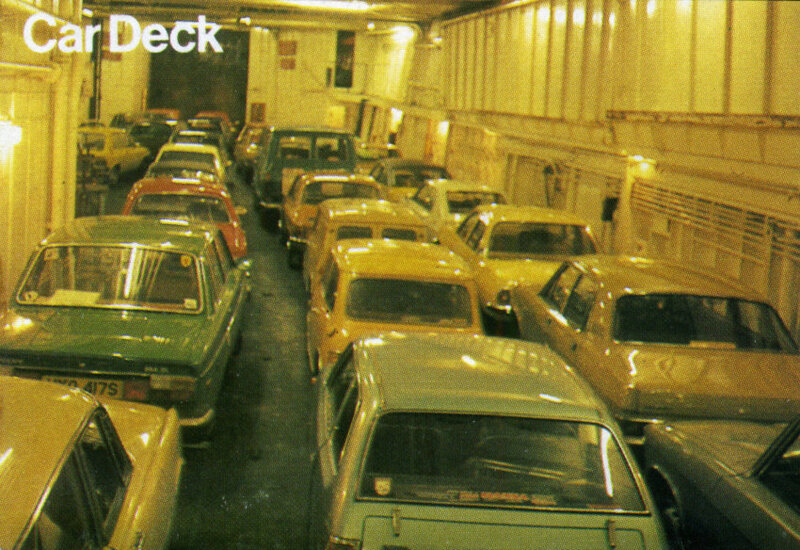 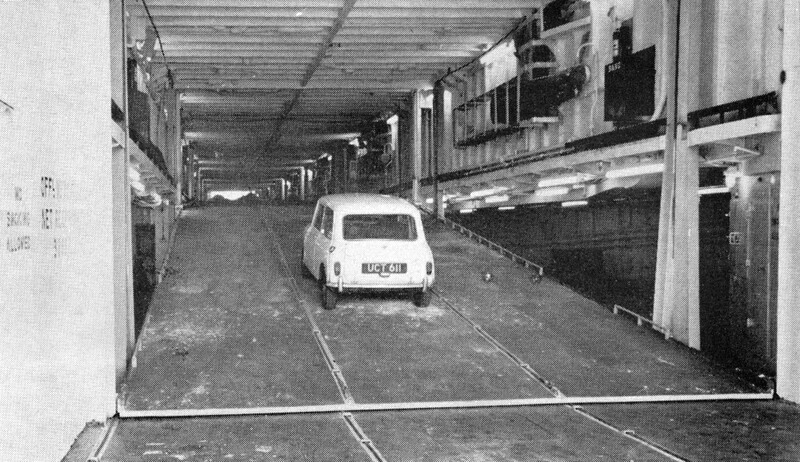 Moving on board and here is a view of the ships car deck during loading. The centre section, between the twin engine casings, was able to accommodate freight vehicles and coaches whereas the wings were car-height only with cabins on the deck above. 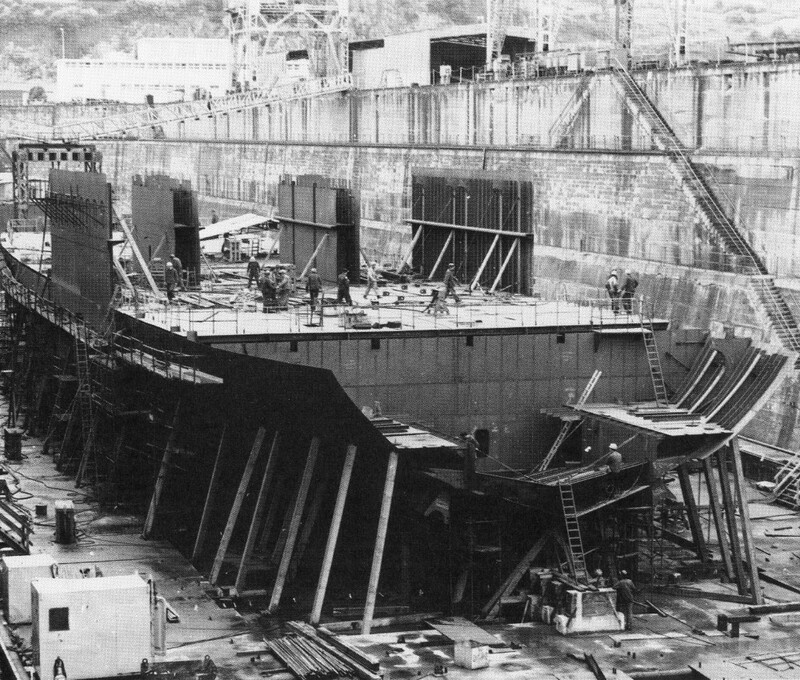 The centre section was also fitted with mezzanine decks of a unique type whereby each panel was able to be used as a ramp rather than, more conventionally, just the end panels. 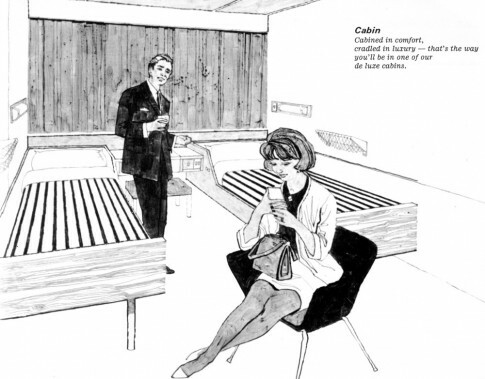 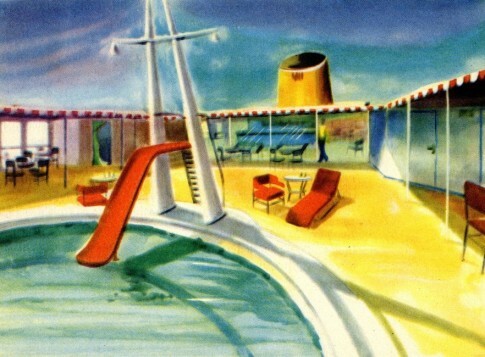 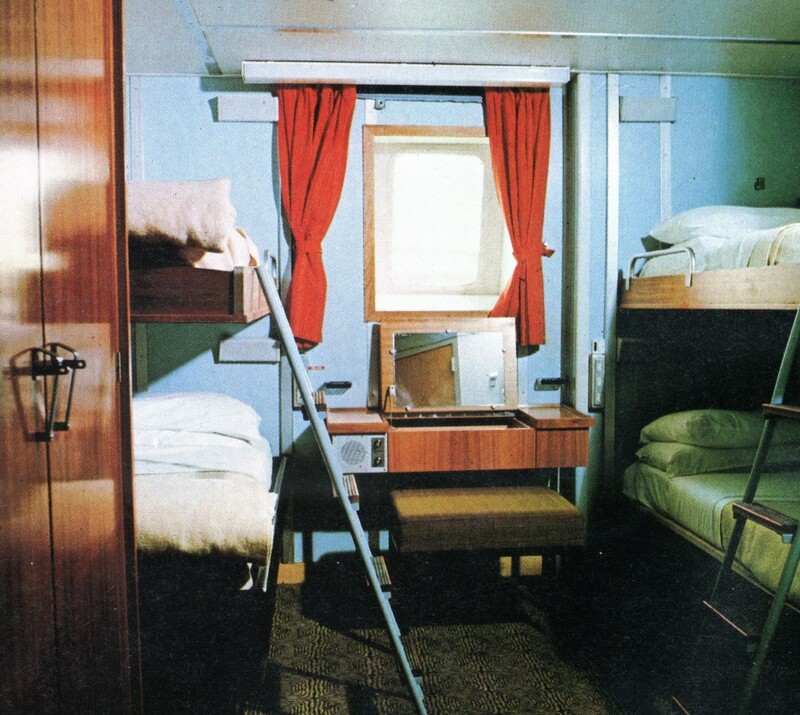 A De Luxe cabin depicted in the introductory brochure - these were located amidships on A Deck, the lower of the main passenger decks. 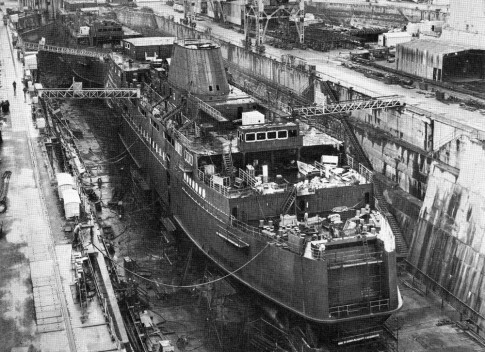 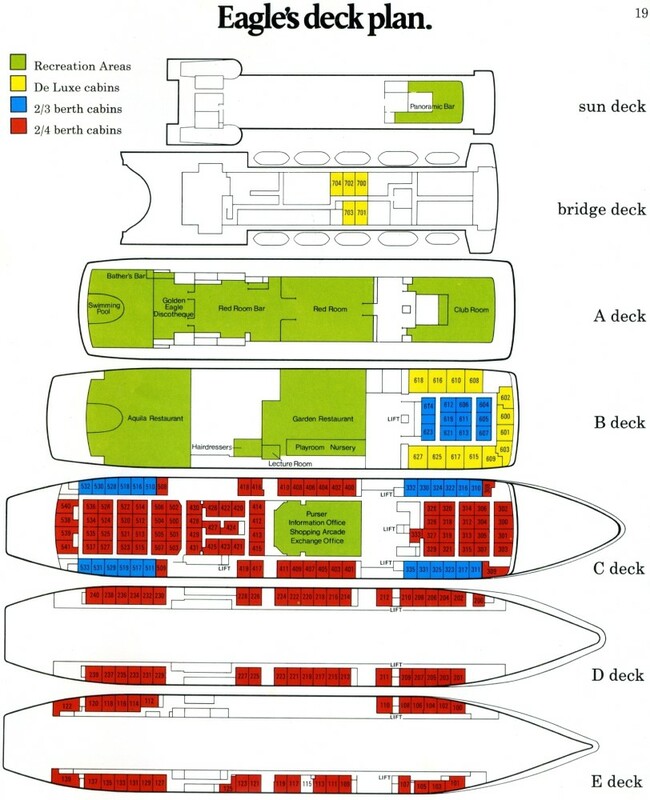 Beneath the vehicle deck (C Deck) were crew and some Second Class cabins whilst along the sides at mezzanine level (B Deck) were First Class cabins (aft) and Second Class (forward) with some interchangeable rooms in between. 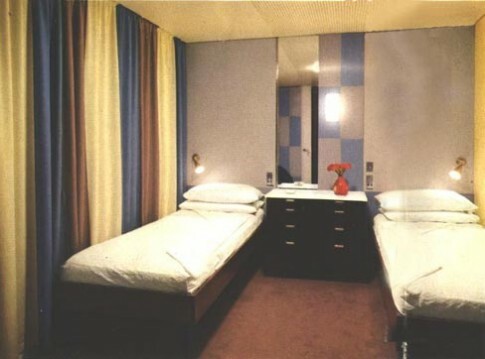 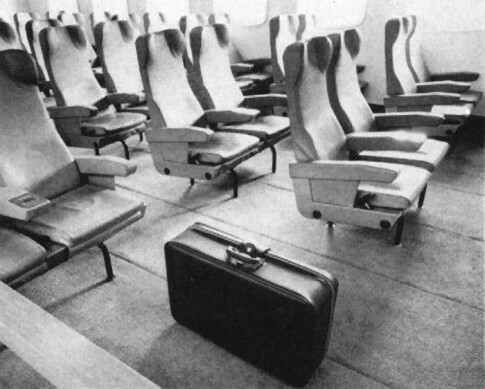 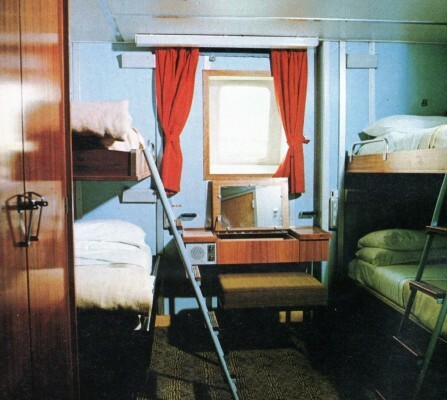 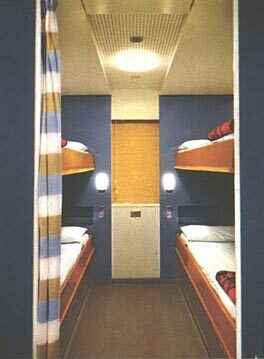 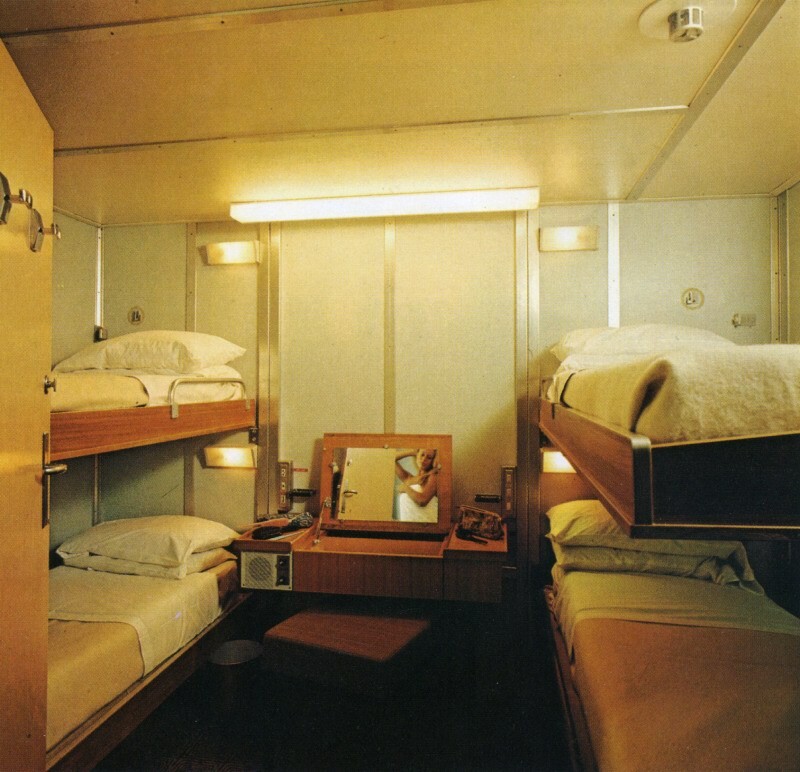 Some of the four-berth outside Second Class cabins at this level were convertible to six-person day cabins. 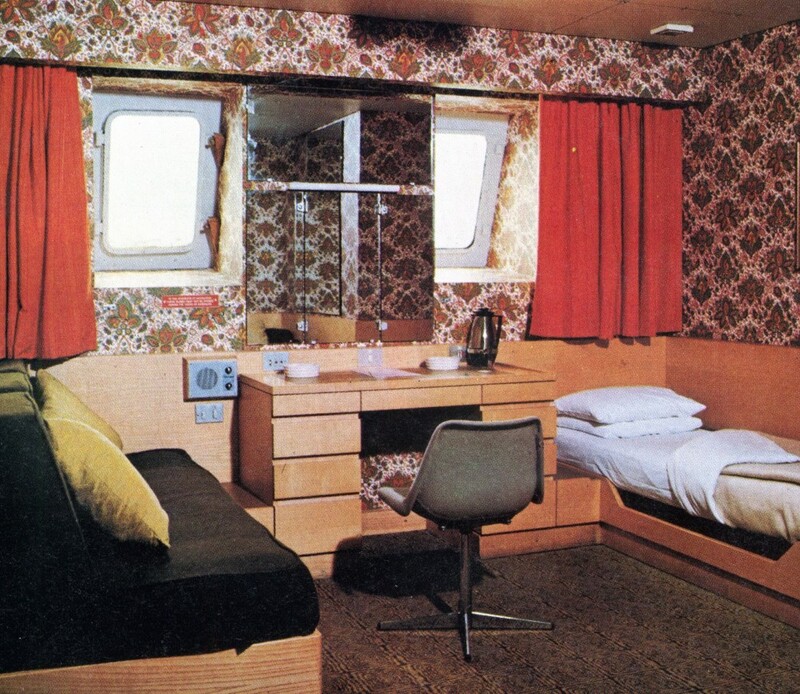 One of the cabins De Luxe on the newly delivered ship. 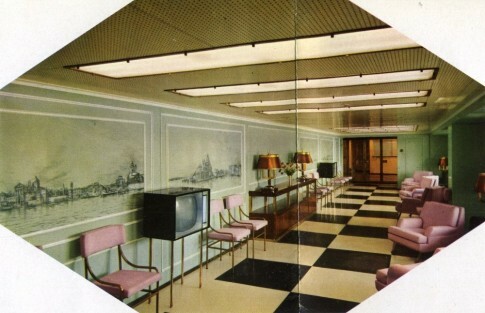 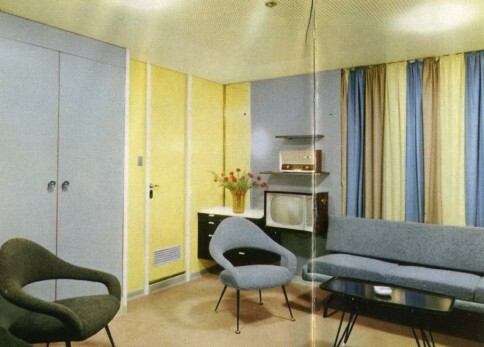 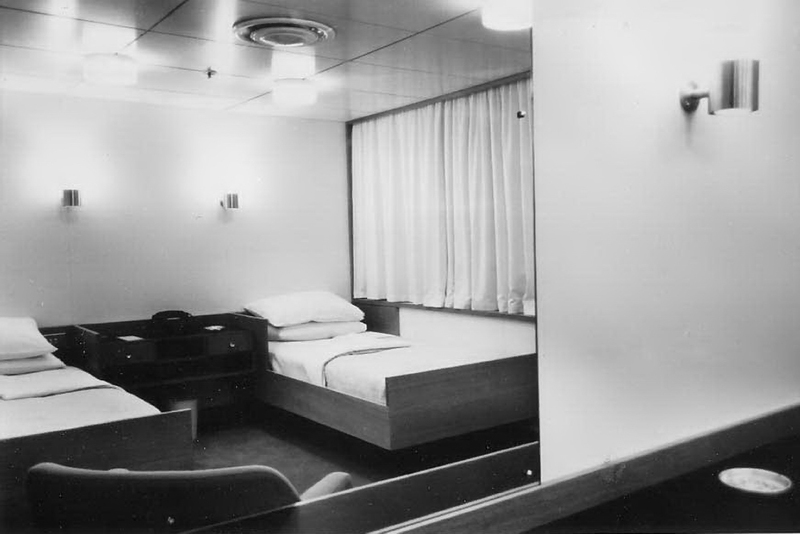 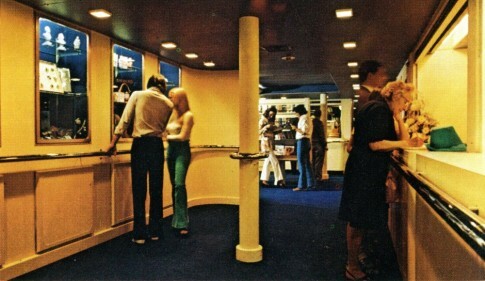 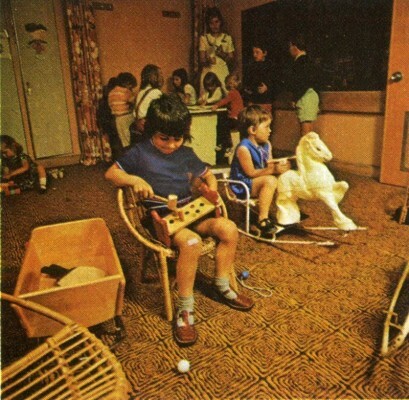 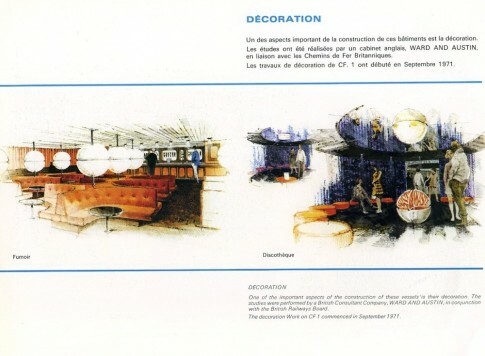 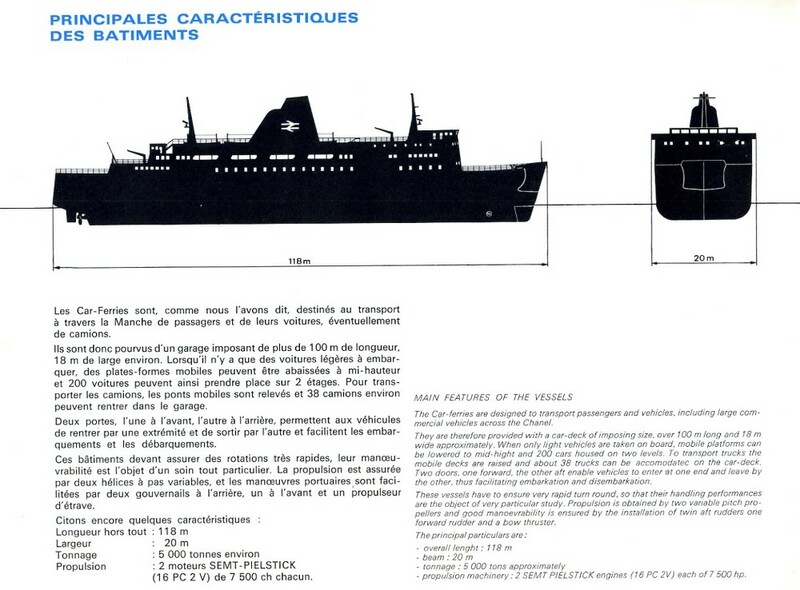 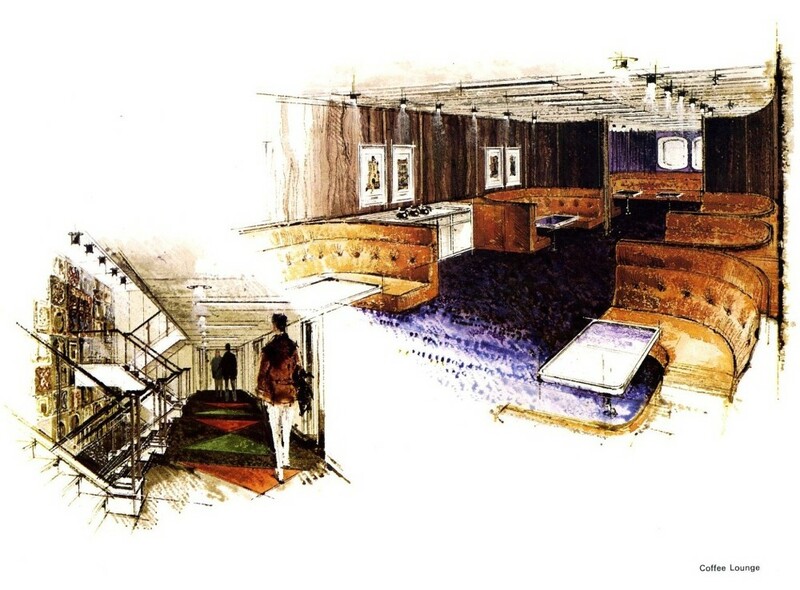 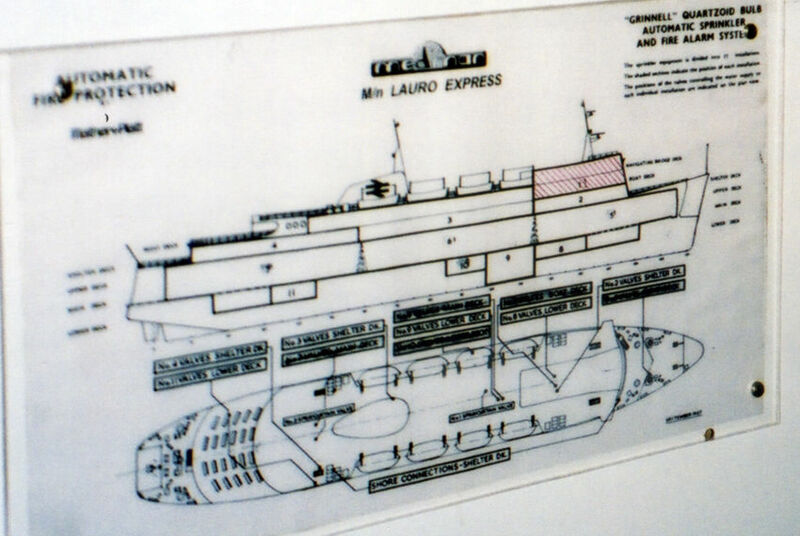 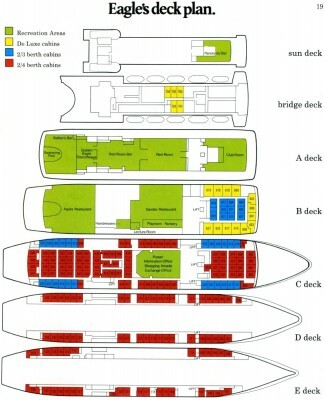 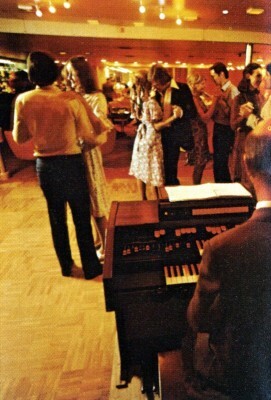 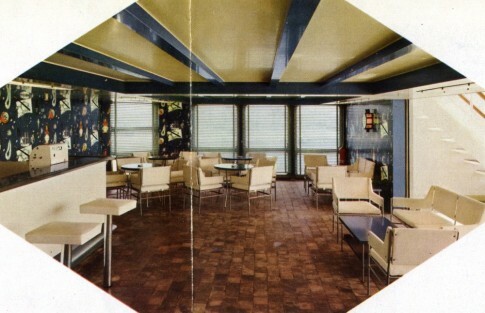 Inboard of the cabins De Luxe on B Deck was the First Class entrance (above and below). 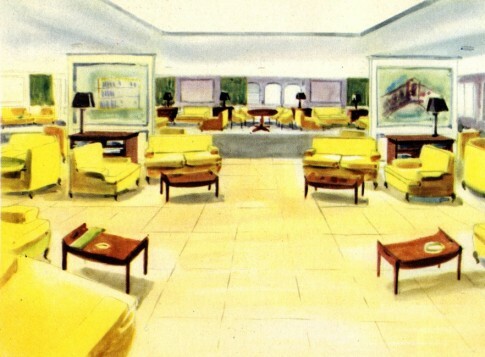 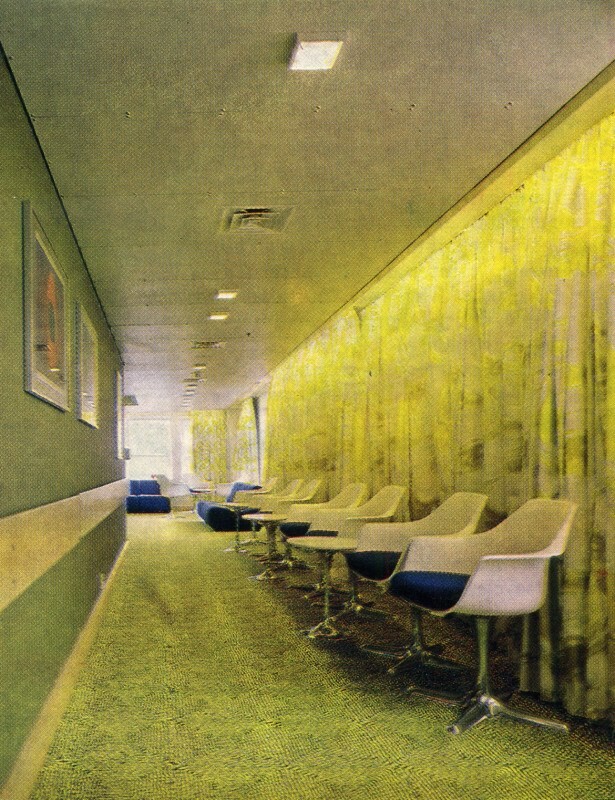 Moving forward, the Second Class entrance lounge was distinctly less opulent. 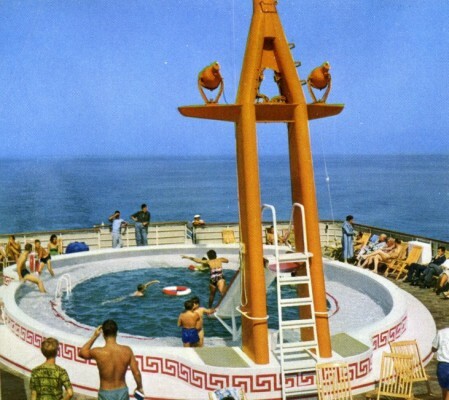 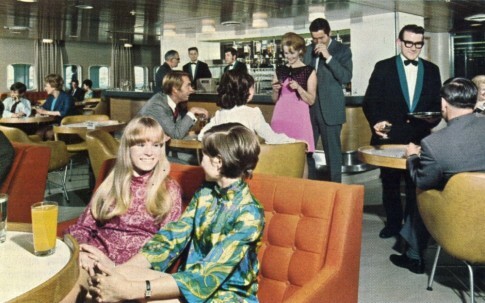 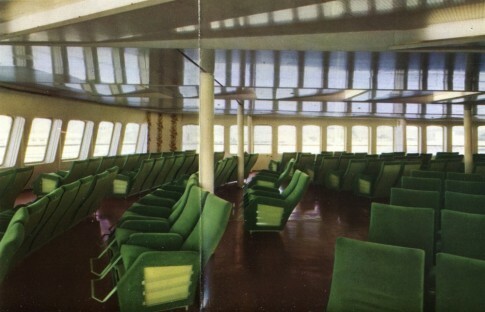 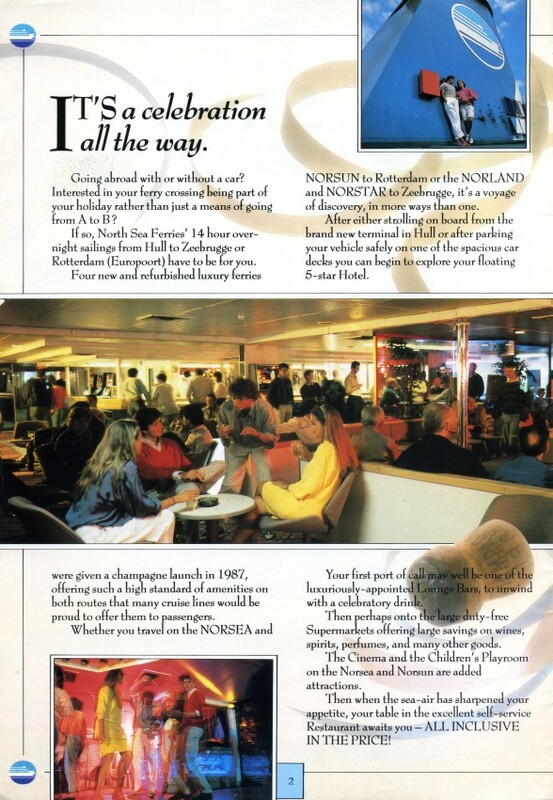 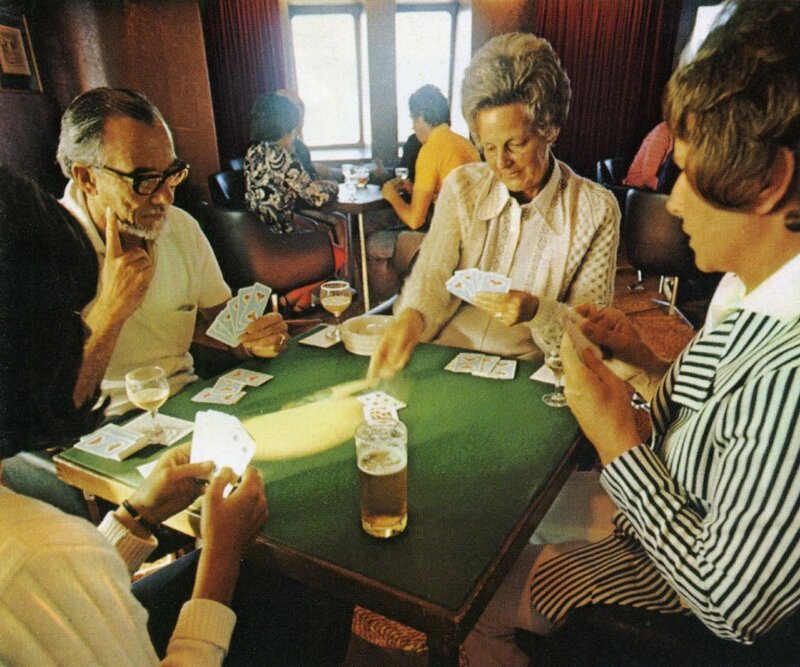 In the background is one of the two Second Class reclining seat lounges (also below); their first class equivalent was right aft on this deck. 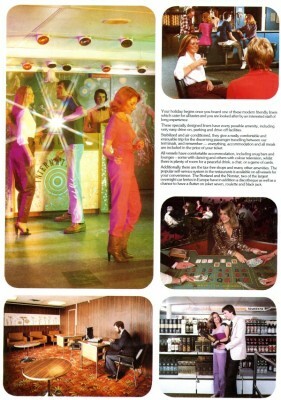 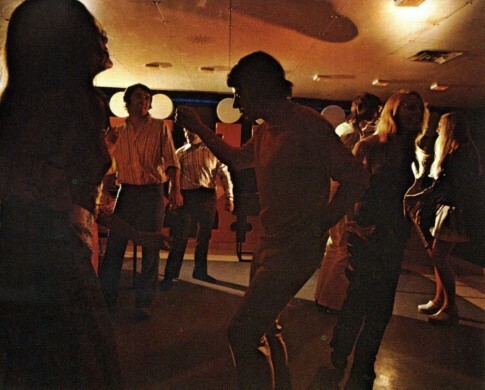 Right forward was the Second Class Smokeroom; the bay seating is a typical Ward and Austin finish of the period but inboard the furniture and lino flooring gives something of a Working Mens Club impression. 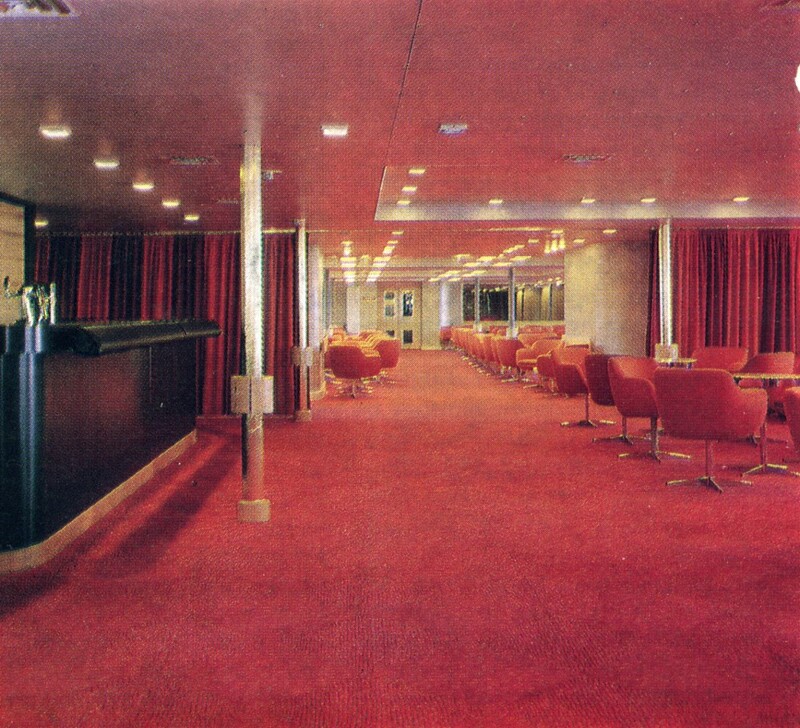 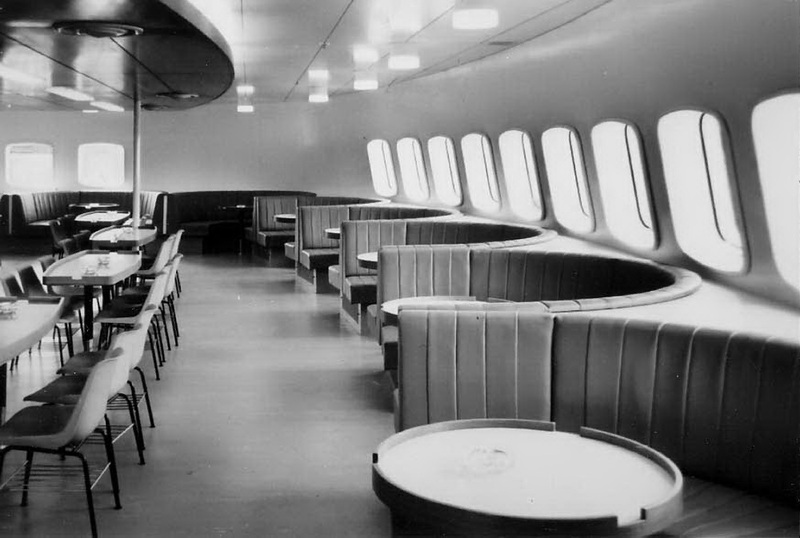 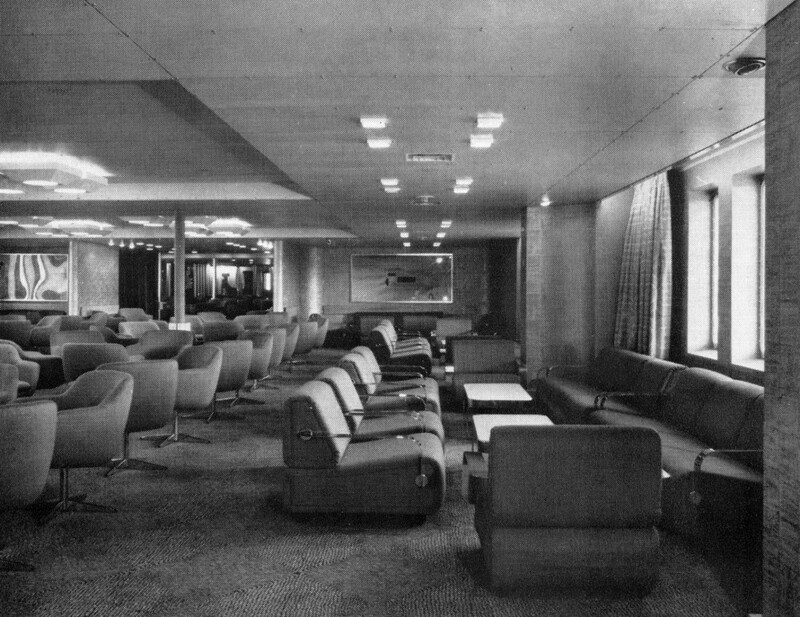 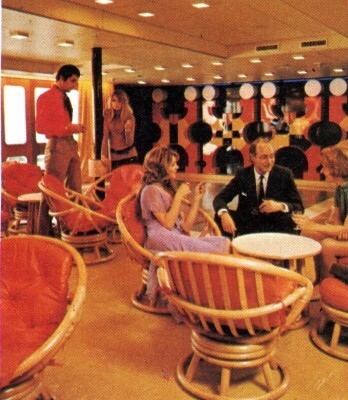 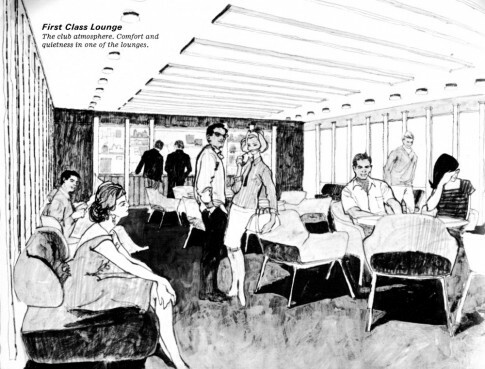 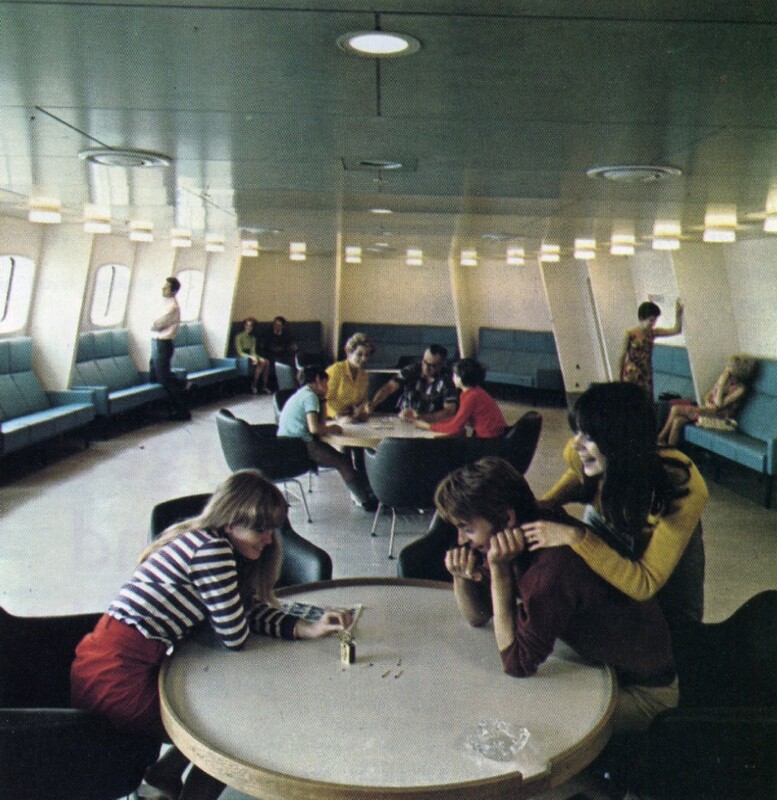 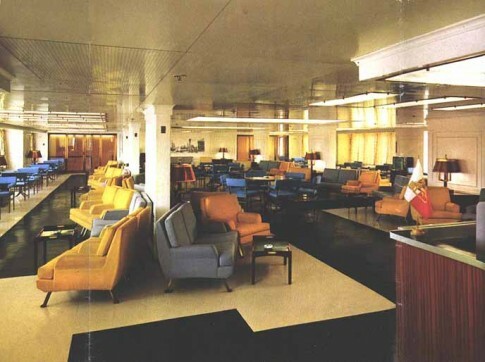 Moving upstairs to Boat Deck, forward was the Second Class Lounge which included this oval section. 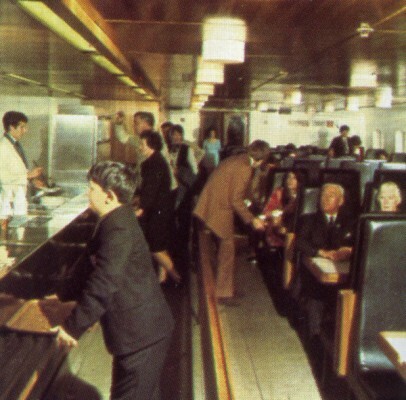 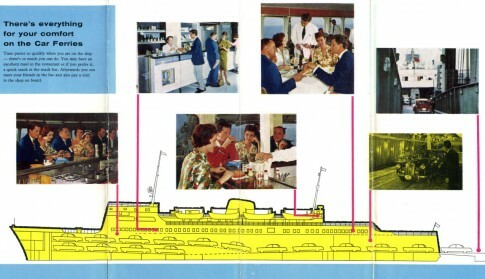 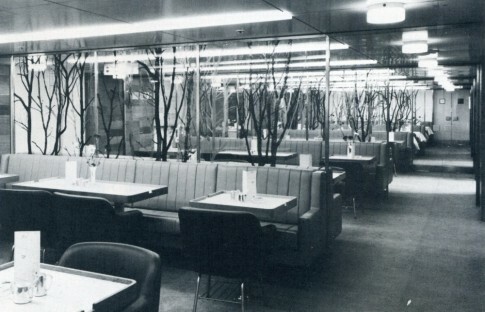 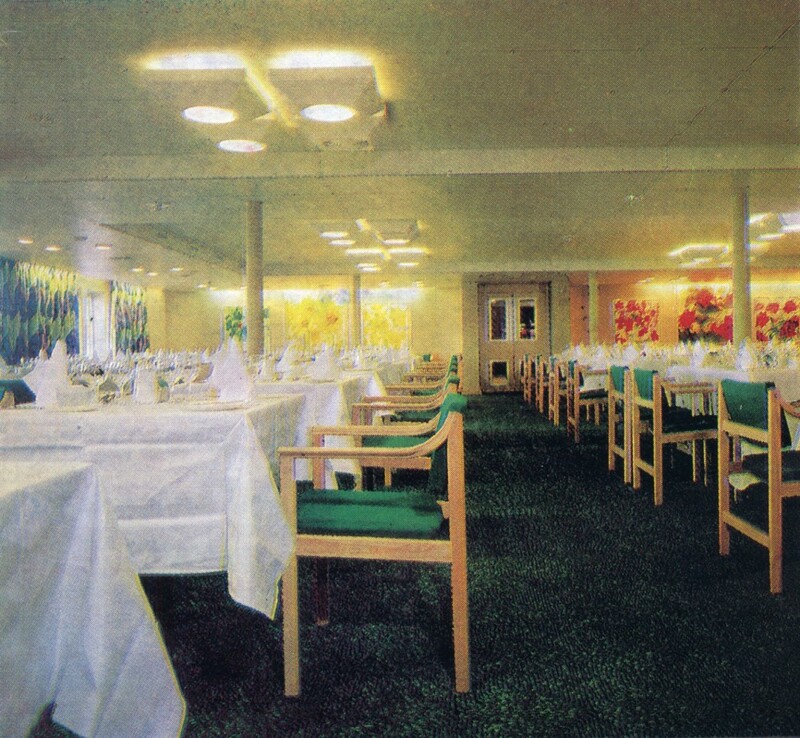 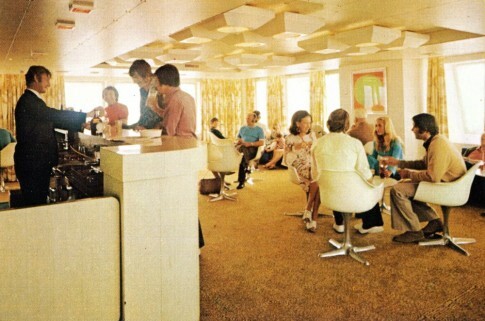 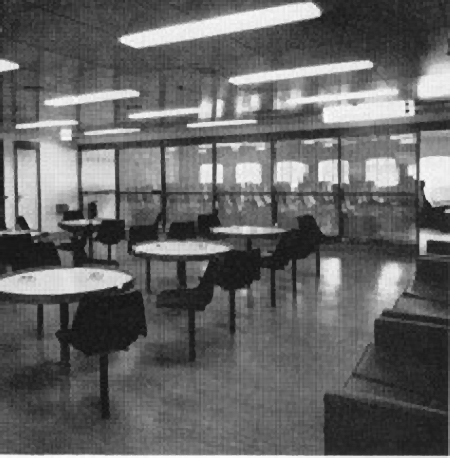 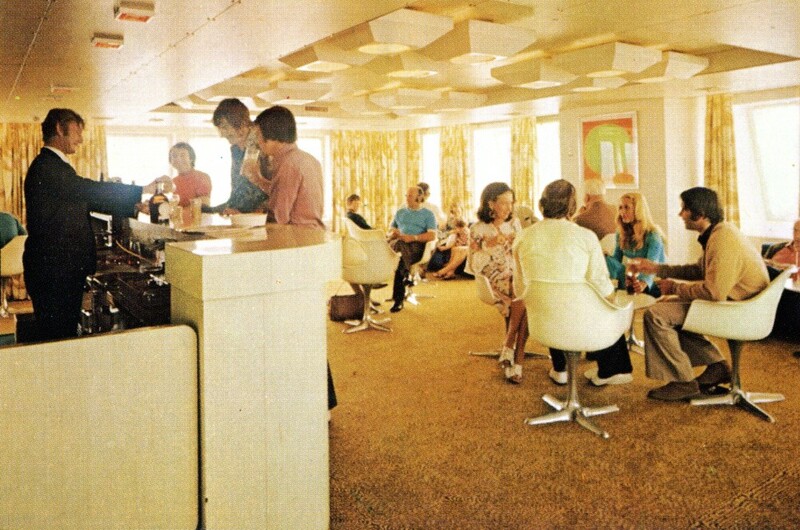 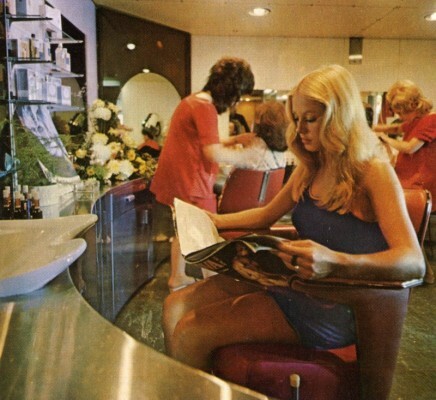 Similar in concept and style to the 1969-built Vortigerns forward cafeteria this became the ships most recognisable interior and is seen, above, as conceived and, below, as realised. 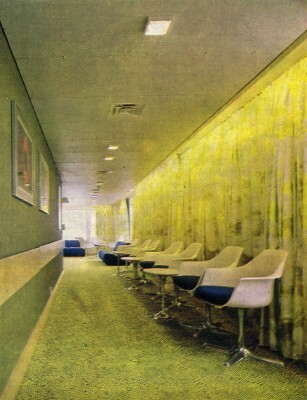 The armchairs were supplied by Hille and bench seating sourced locally from Robson of Newcastle. Just aft of the Second Class lounge was the Second Class cafeteria. 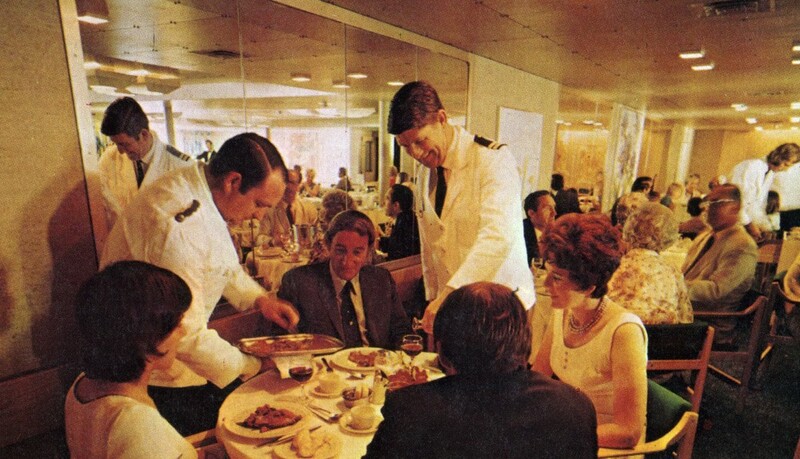 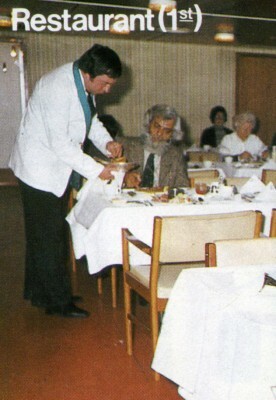 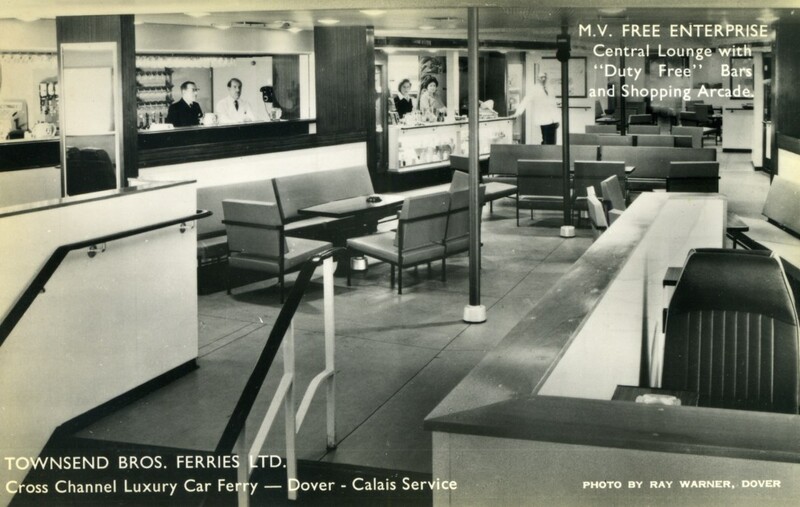 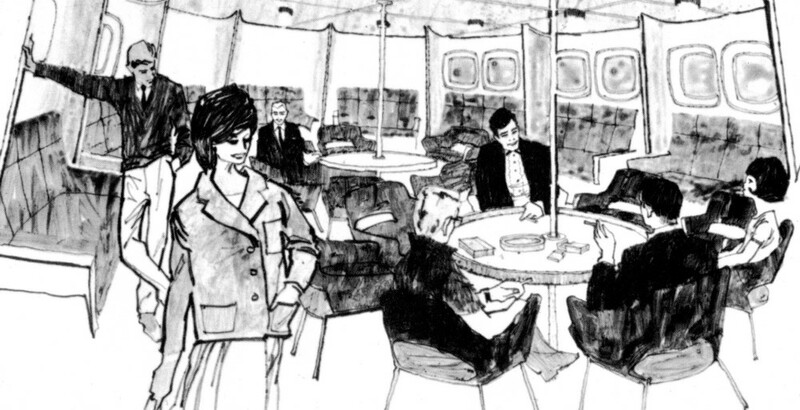 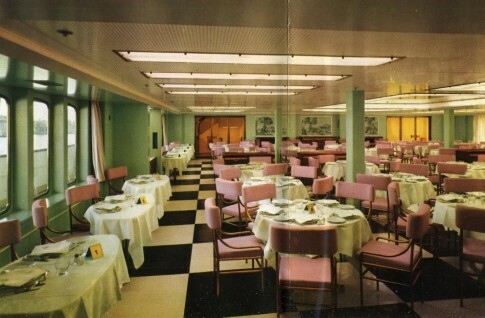 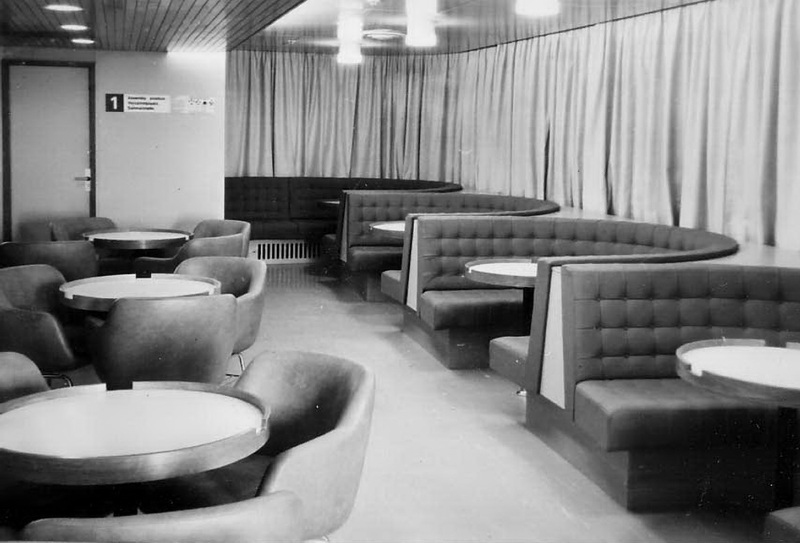 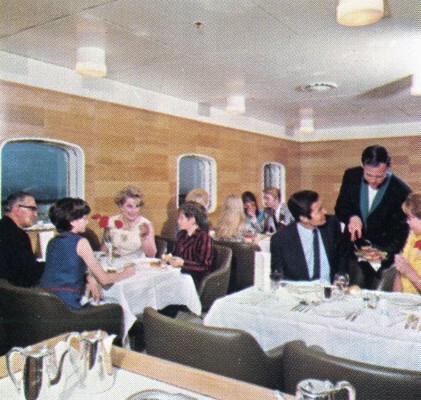 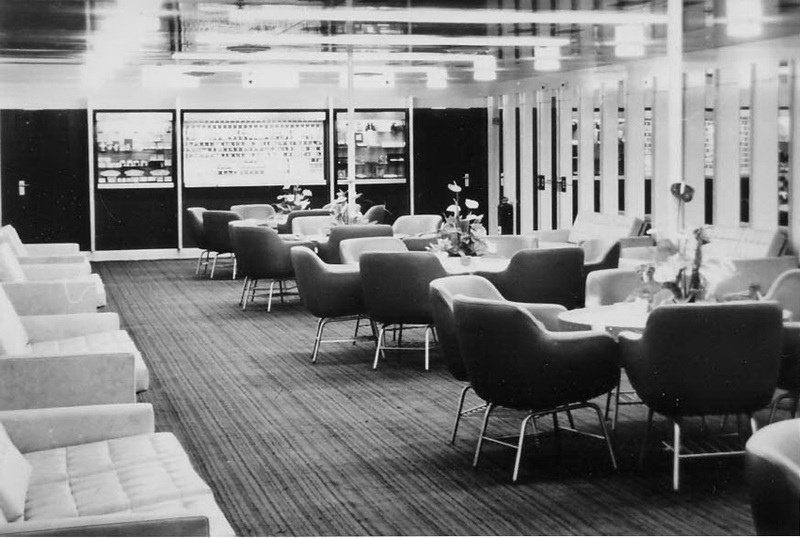 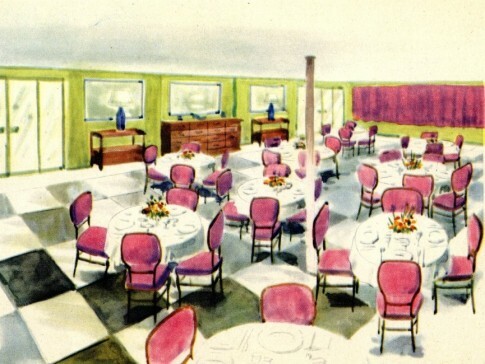 Separated from Second Class by the galley, towards the stern of Boat Deck was the First Class restaurant and tea lounge (the centre sections of which are seen above and below). 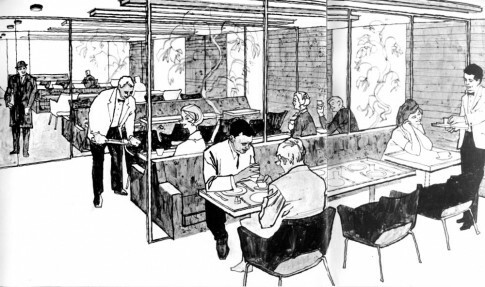 The brochure notes rather suggestively, 'the luxury hotel setting of the Restaurant and Tea Bar is very stimulating - and not only to the appetite! 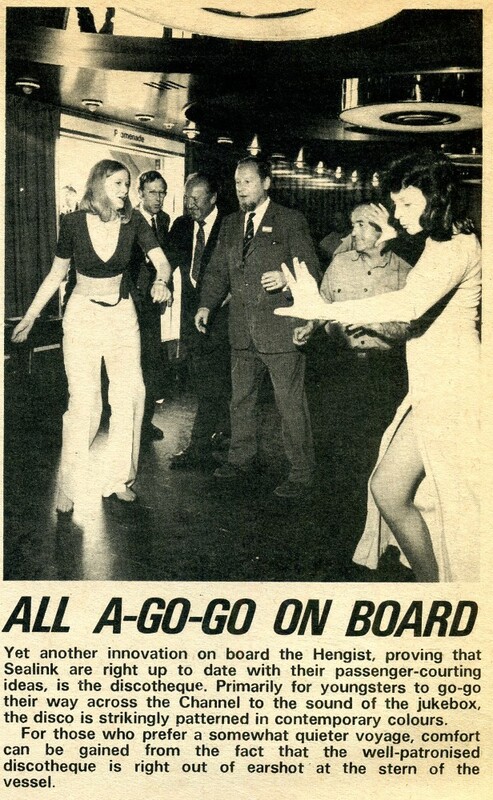 ', which perhaps explains the adoring gaze of the female passenger, far right. 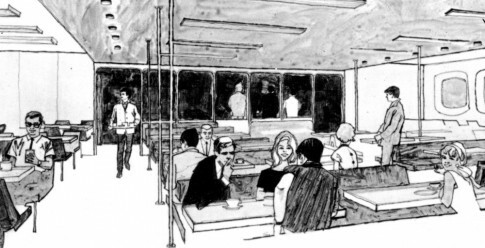 The outer wings of the restaurant had a slightly more formal air. 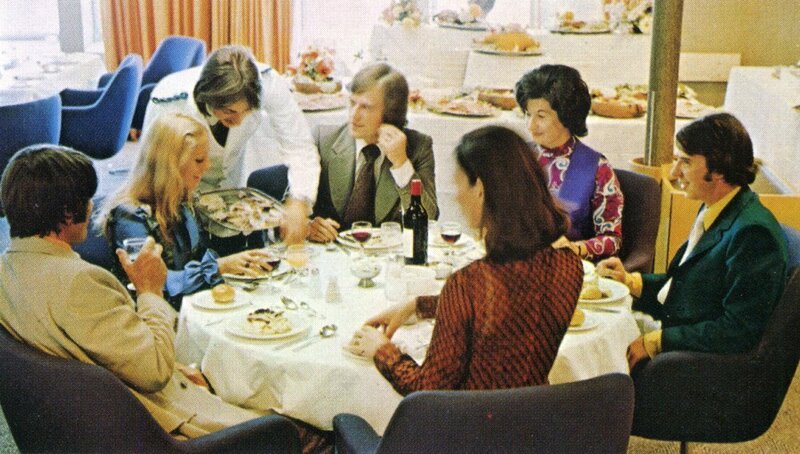 'As a romantic touch that adds to the sense of occasion, British Rail have revived the custom of offering the ladies a flower of their choice on entering the restaurant'. 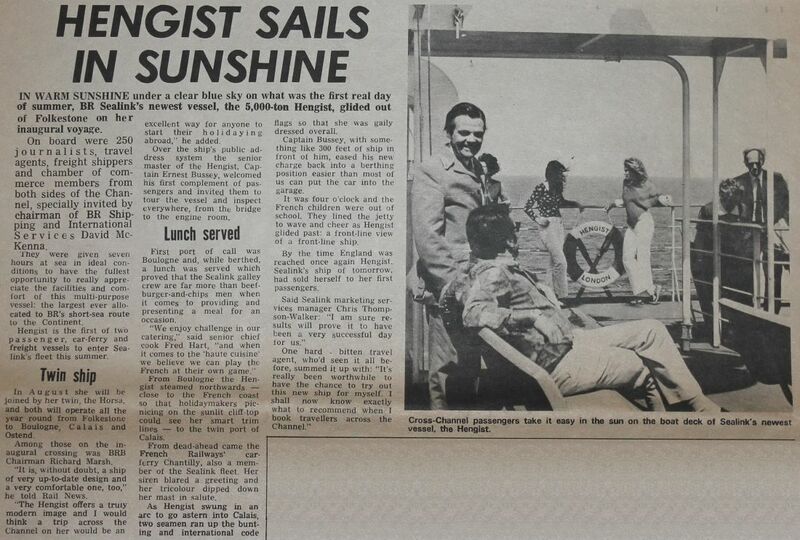 The galley was 'equipped with every modern device to enable it to perform culinary miracles with micro-wave ovens, infra-red grills and three stage refrigerators'. 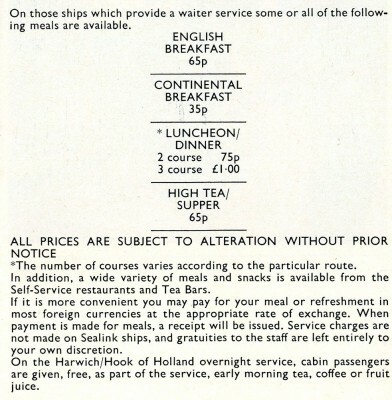 'Harwich-Hook really cares about meals and takes time and trouble to prepare them to the most appetising - even succulent - standards. There's a wide variety of dishes on offer and you can enjoy restaurant service with trained, efficient and courteous stewards ready to obey your every wish'. 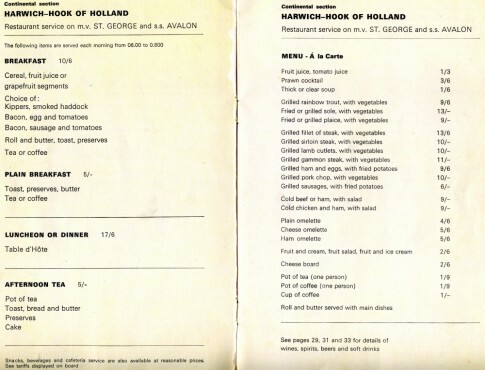 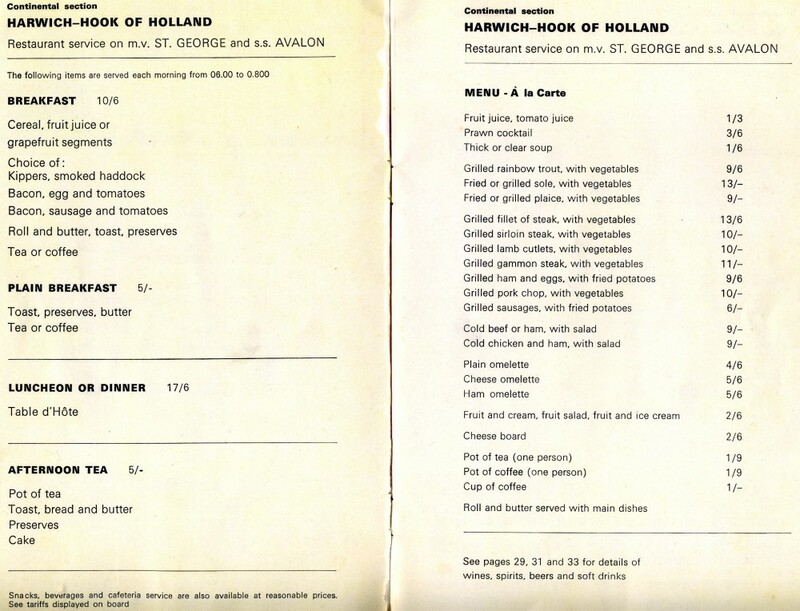 Here, a menu from 1969 shows the items - which, yes, may even be succulent - that were available on the British ships. Right aft was the First Class Smokeroom above and below. 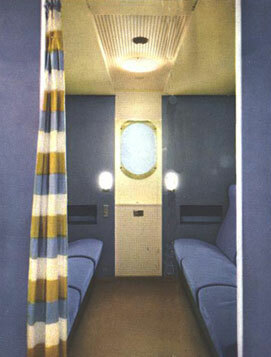 A corner of the First Class smokeroom. 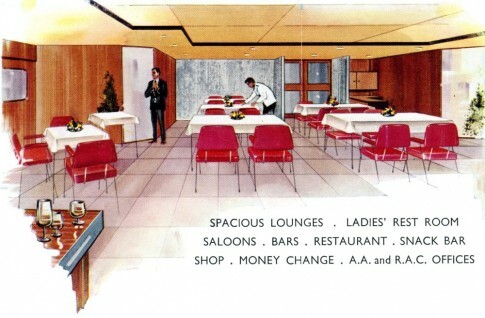 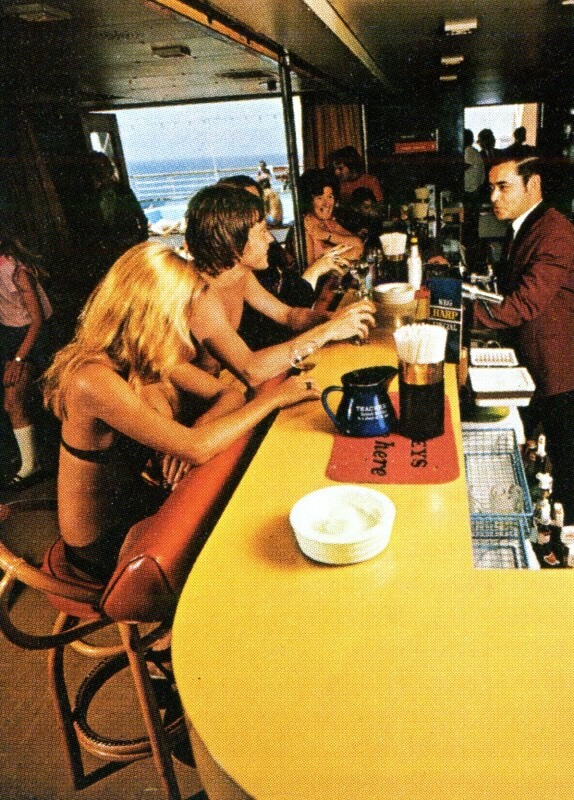 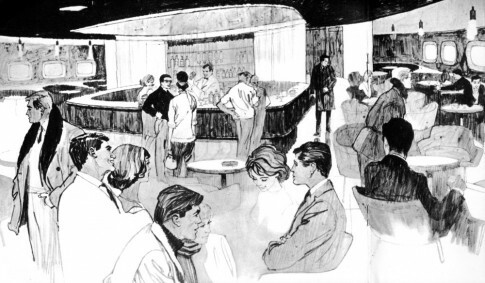 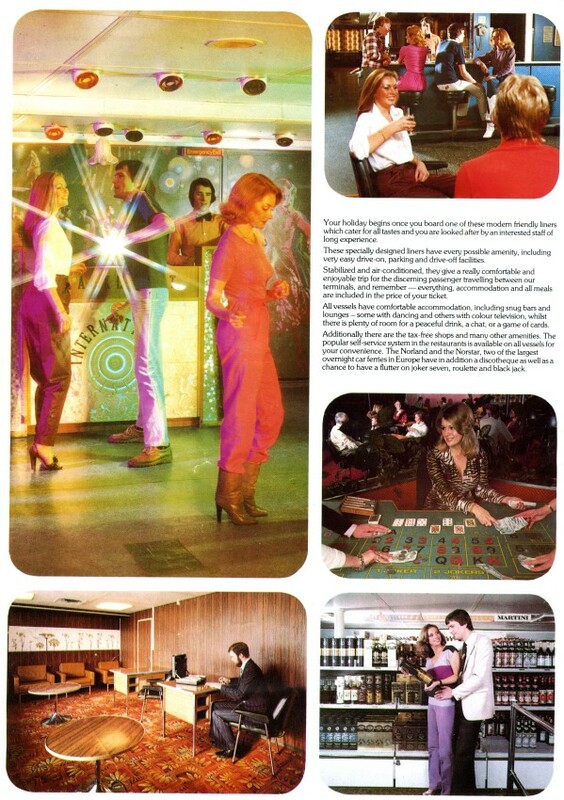 This bar was 'the place for anything from a glass of milk or an aperitif to a liqueur' with 'Steward-service to give you that luxury hotel feeling'. 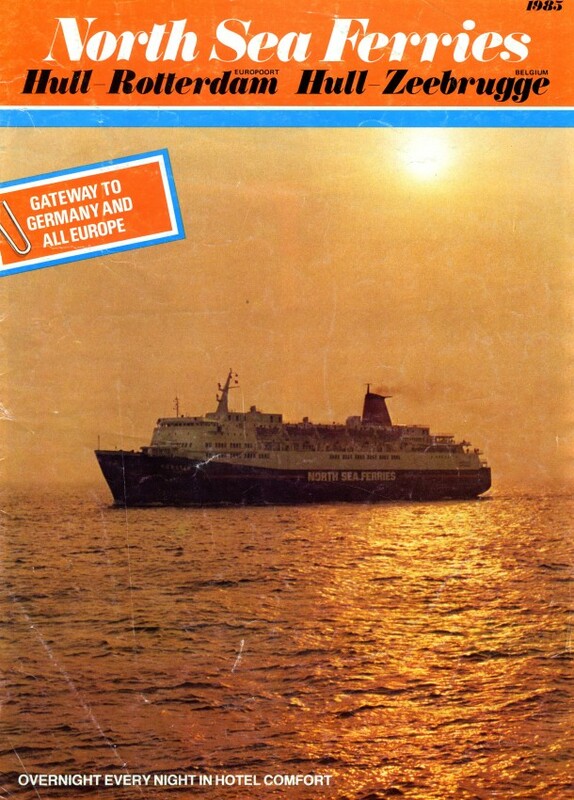 An afternoon arrival at the Hook of Holland. 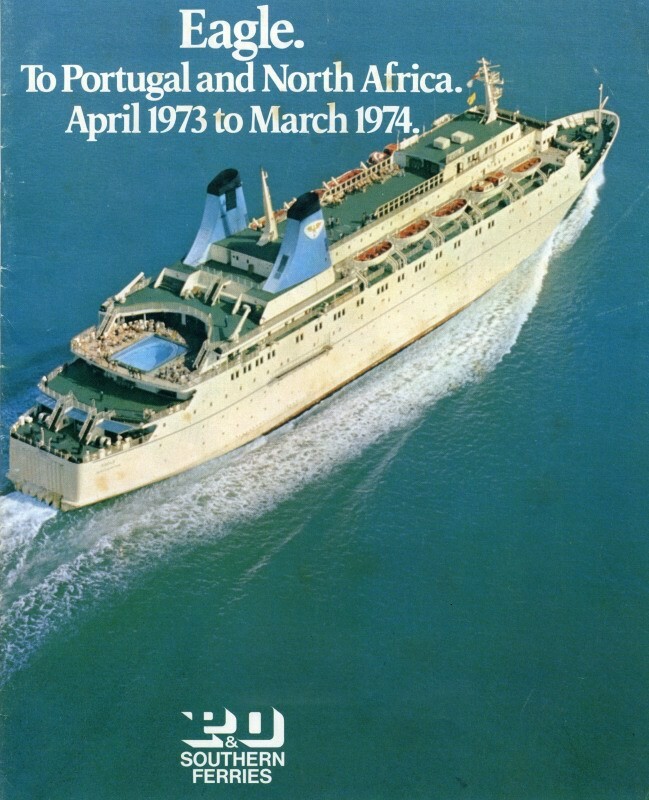 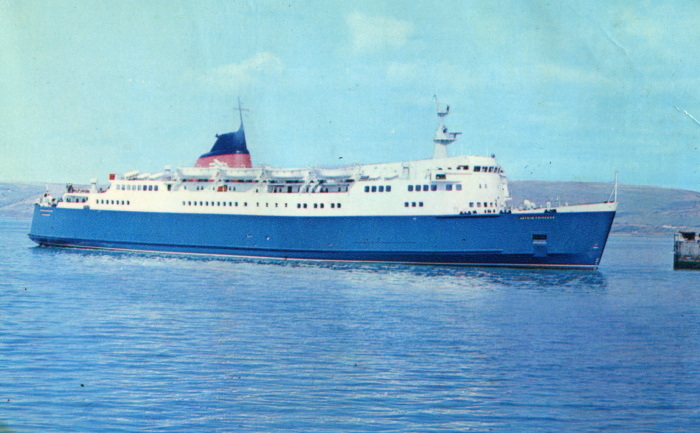 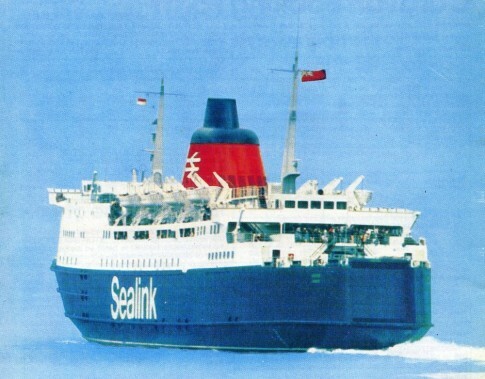 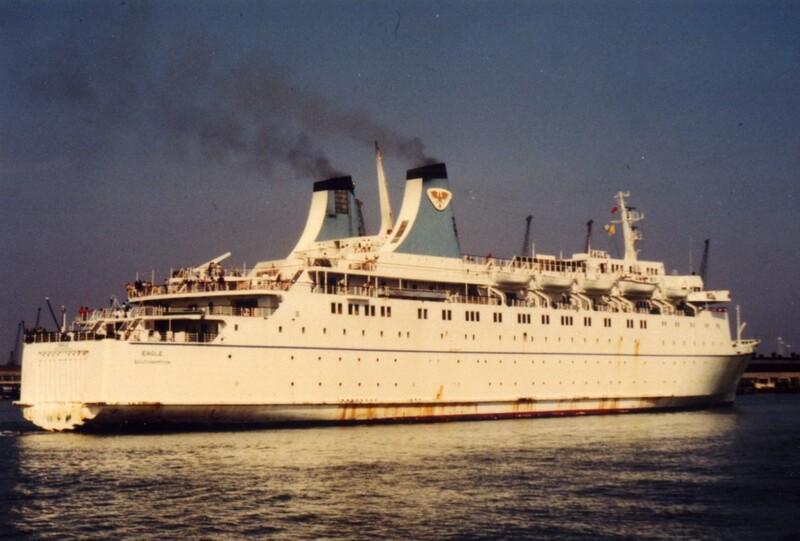 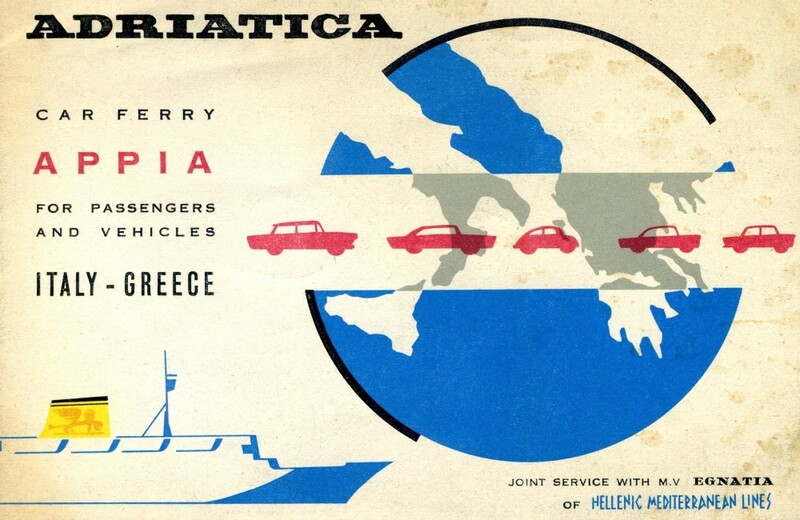 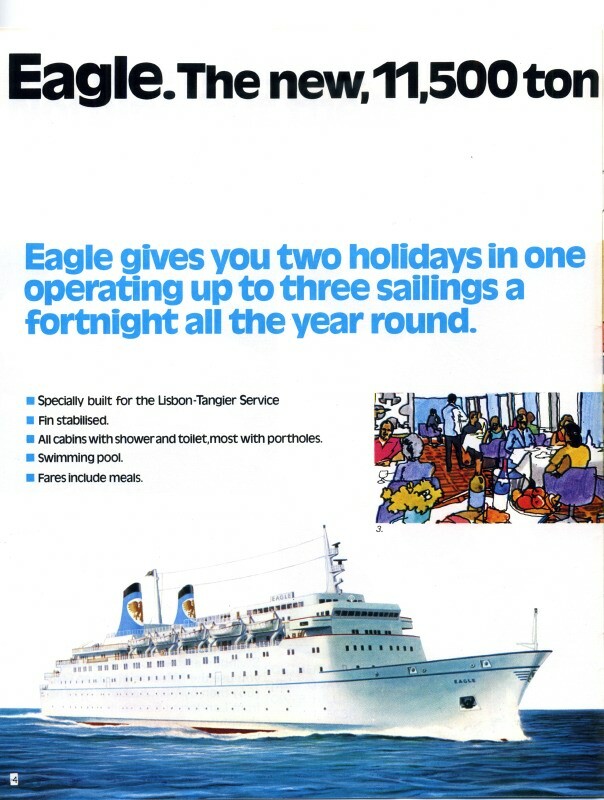 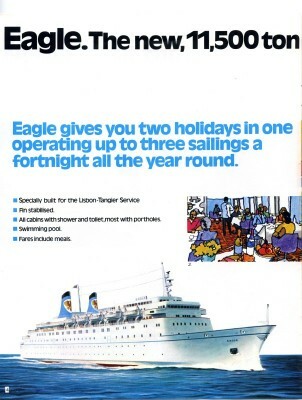 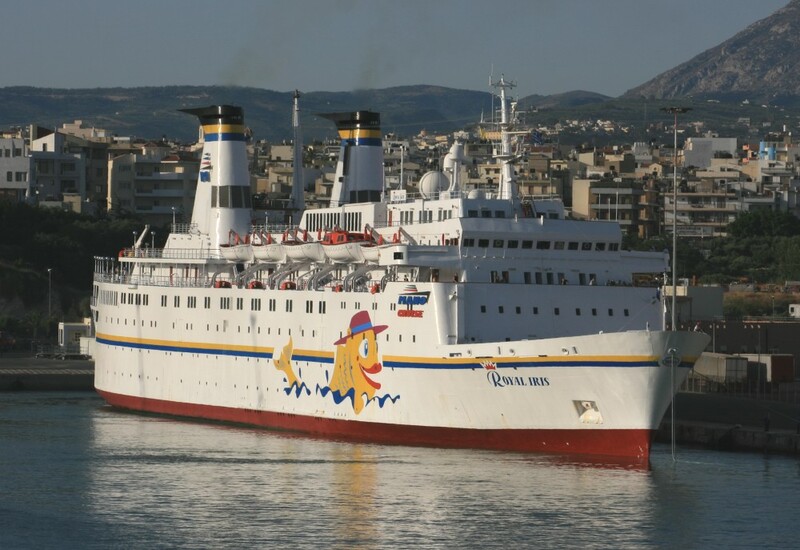 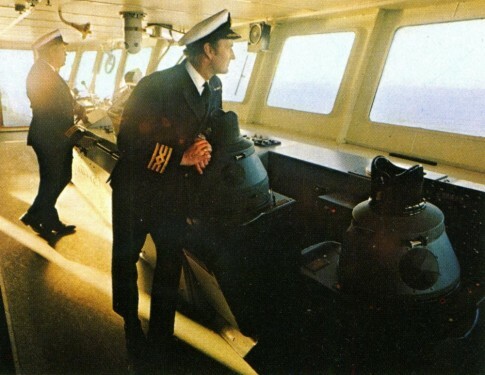 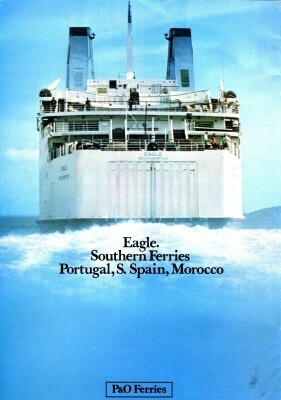 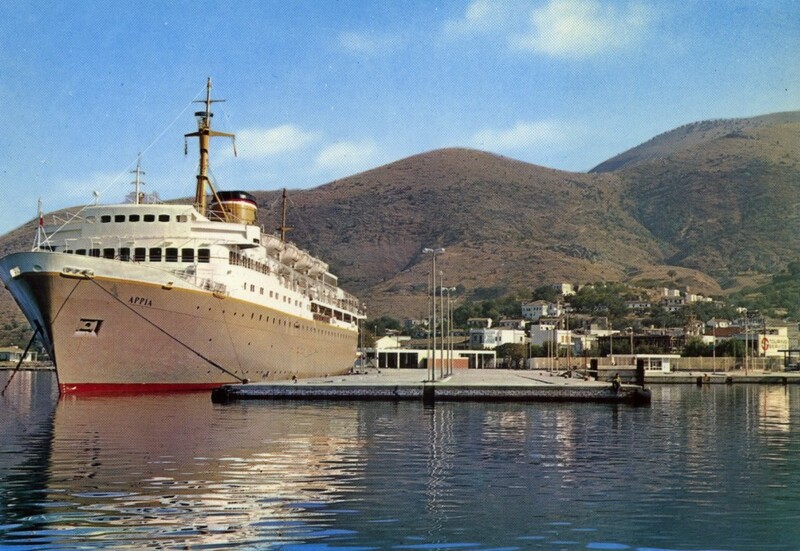 The St George was sold out of Sealink service in 1984 becoming the Patra Express of Ventouris Ferries for whom she operated Adriatic itineraries. 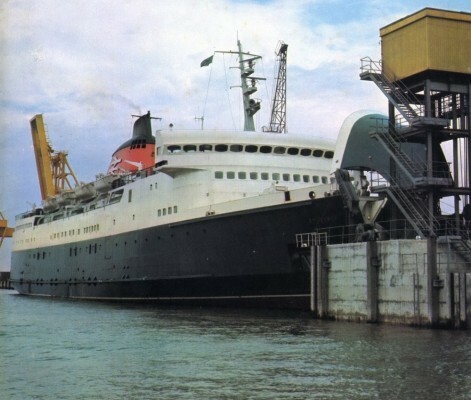 Re-engined in 1988, she left Greece in March 1990 under the name Scandinavian Sky II for Immingham where a prolonged refit kitted her out for use as a casino ship in the USA. 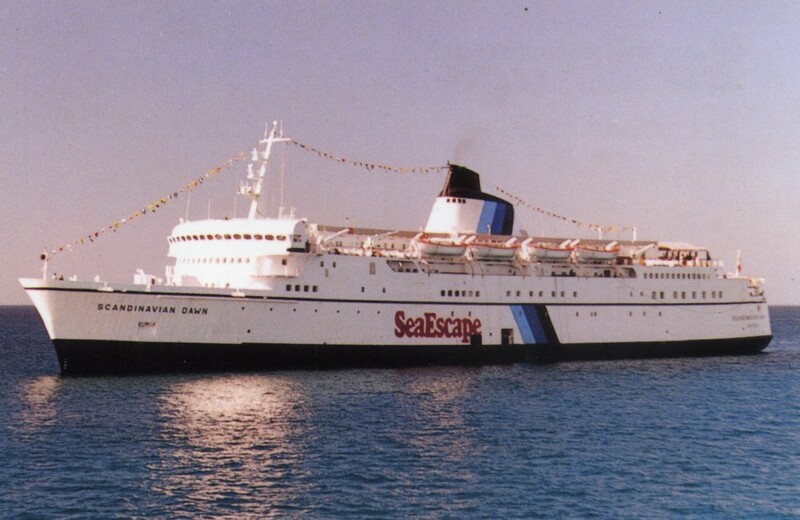 Under the successive names Scandinavian Dawn, Discovery Dawn, Island Dawn and Texas Treasure she saw out her days before finally the St George went for scrapping in 2008. 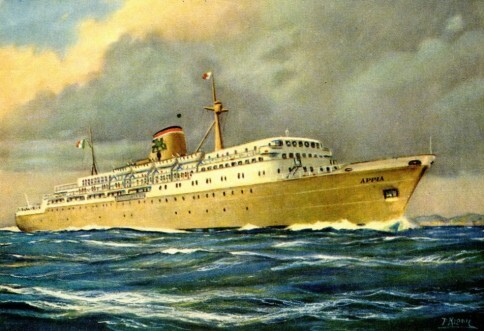 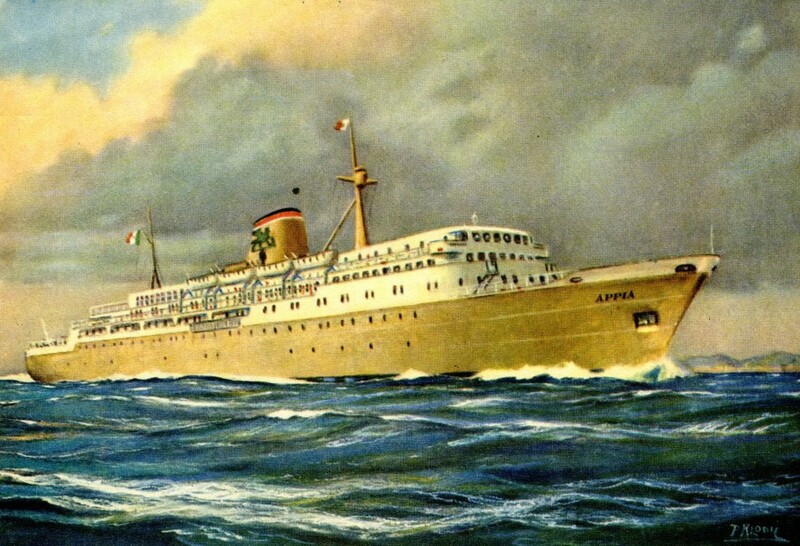 Her Dutch half-sister, the Koningin Juliana, was displaced by the new Prinses Beatrix in 1978 and after several years in a supporting role eventually passed to NAVARMA (Moby Lines) in 1985. Operating from Livorno to Bastia as the Moby Prince she collided with a tanker off the Italian port in 1991, the disastrous subsequent fire killing all but one of the 142 people on board. 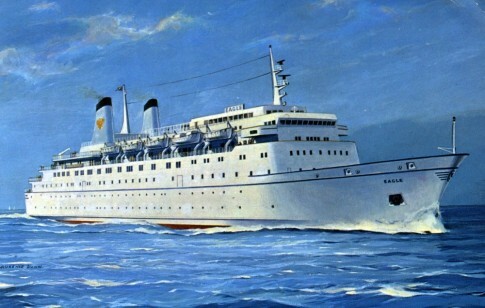 The St George as Scandinavian Dawn.